Lucky to have Morning Work? You bet. It has changed my mornings completely. My kinders rush into class and can’t wait to start the day. Tardies? Nope! Dawdling in the hall? Nope! It makes for a much more pleasant morning, and my students are getting that extra, hands-on practice they so desperately need. They think they’re ‘playing,’ but we will just keep the fact that they are actually working between us teachers, ok? 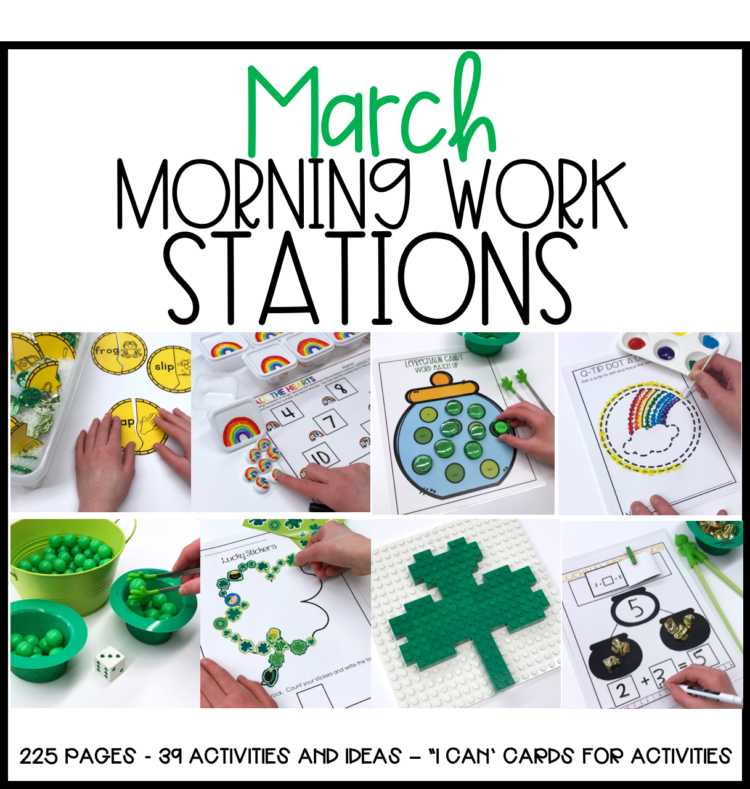 This set of morning work activities has 39 station activities and over 225 pages. It’s huge and will give you so many options from which to choose. In my own class, I typically use between 12-15 and the rest I can put in my Word Work or Math Stations if I want, but I always have a choice. Below I’ve given you a very brief glimpse of March’s packet. Remember, if you would like to see a detailed materials list of where I secured the items for these stations, just click HERE. I have a list of each month. If you scroll all the way down, you’ll find March. This station is editable. 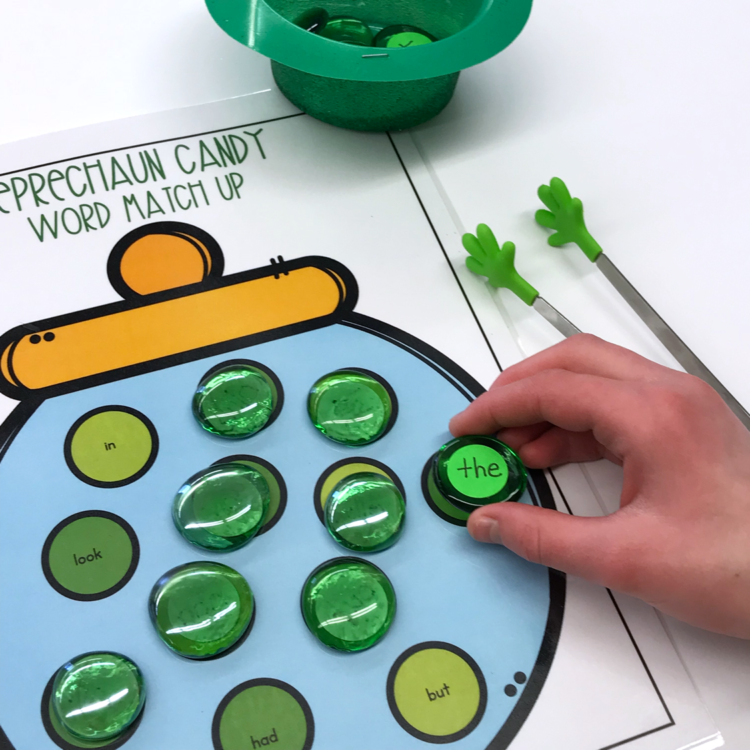 You can enter your own sight word list to add to the leprechaun pots and then use the leprechaun’s gold letter cards to link the letters to reproduce the words. Just add plastic links and you’re all set to go! 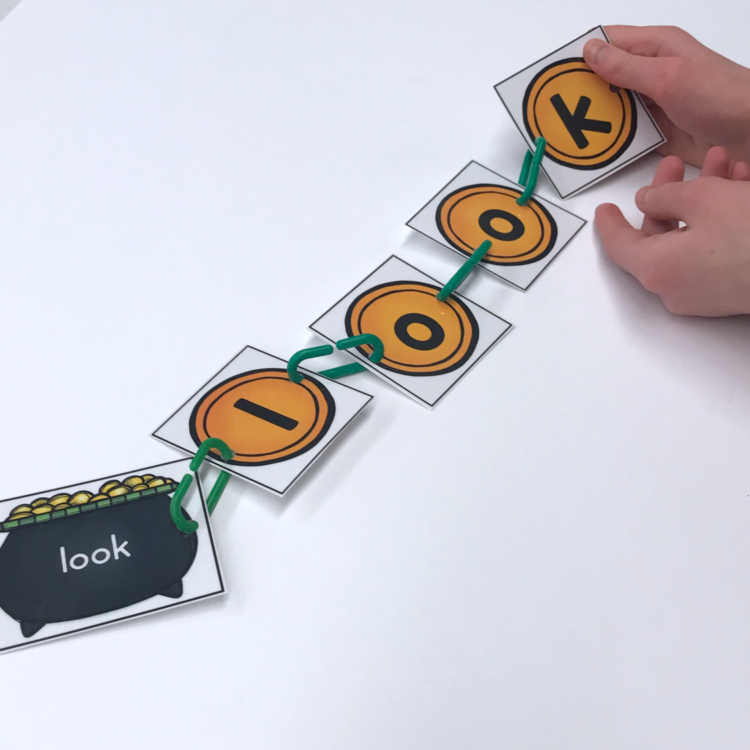 Use those same plastic links and this time, practice making CVC words. The wonderful thing about this activity is that it is self-correcting. 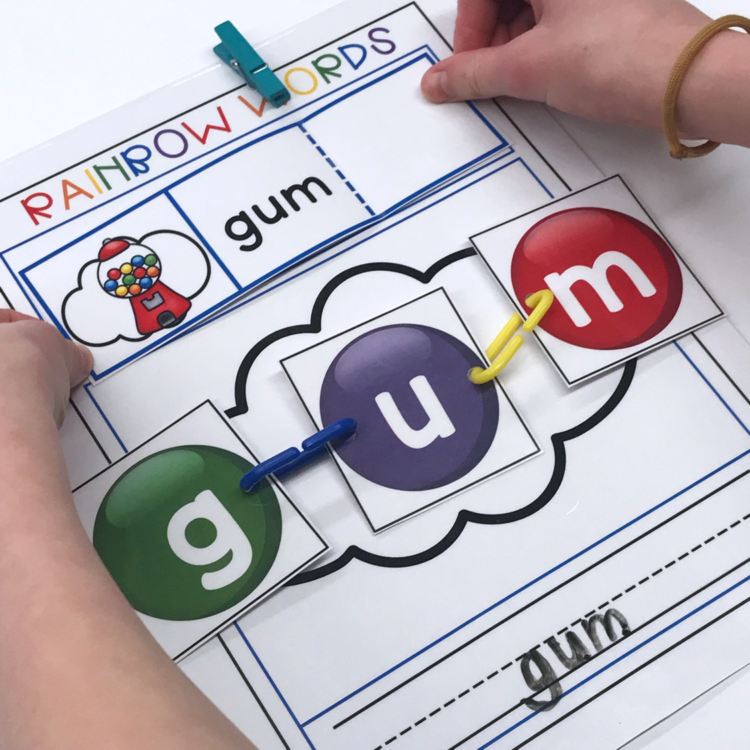 Students create the word by linking the color or the rainbow cards, write the word . . .
and then open the card and check to see if the answer is correct. 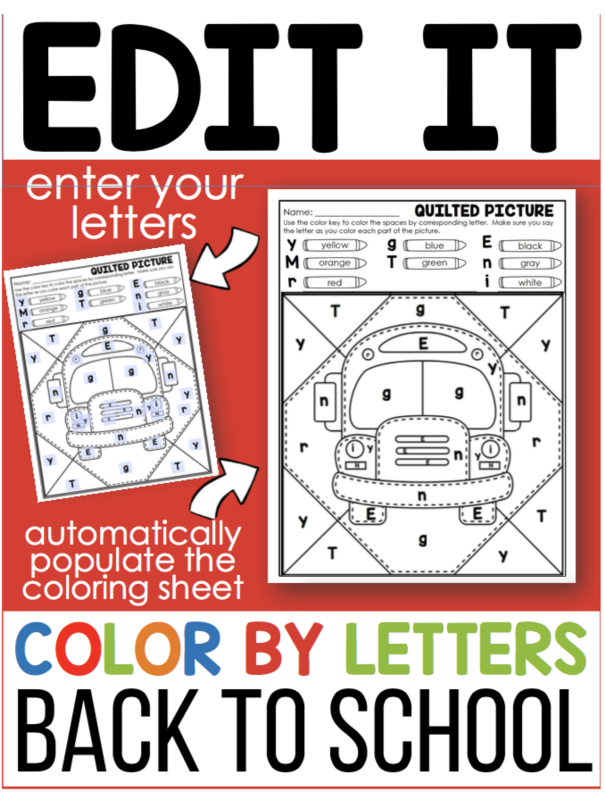 If you’d like to change it up a bit and extend this activity, add colored letter beads. More fun with plastic links! (I bet you never imagined they could be used in so many ways.) This time students link all the various values of numbers together . . . numbers, quantities, ten frames and tally marks. 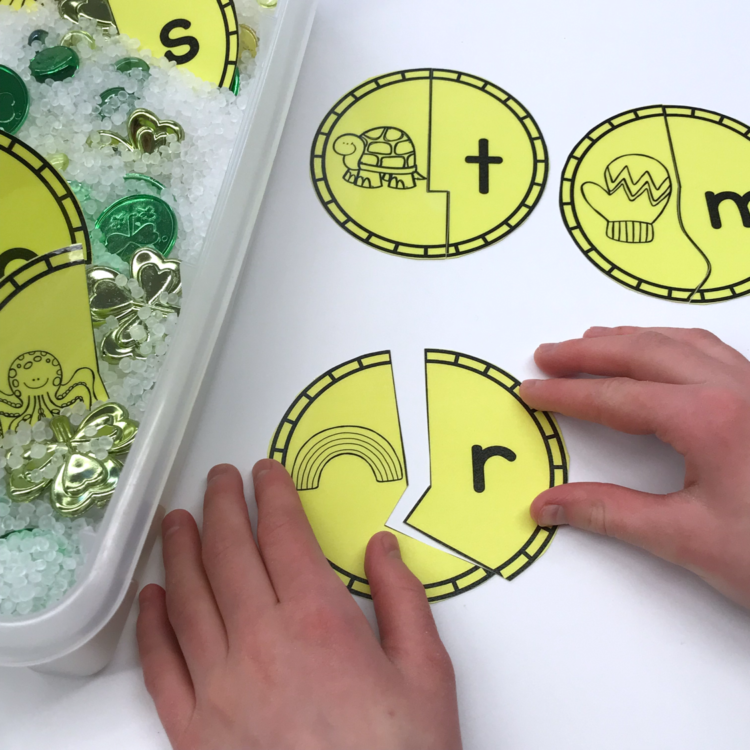 I love these editable sight word sand trays because I can simply enter different lists of words on different colored Astrobrights cardstock and . . . Ta Dah . . . they are instantly organized for differentiation. This month I took a common Dollar Tree small cake pan and painted the bottom of it with acrylic paint in a rainbow pattern. I slapped a little Modge Podge over it just to make sure it was protected and then a bit of salt. The result is rainbow writing in a whole new way. 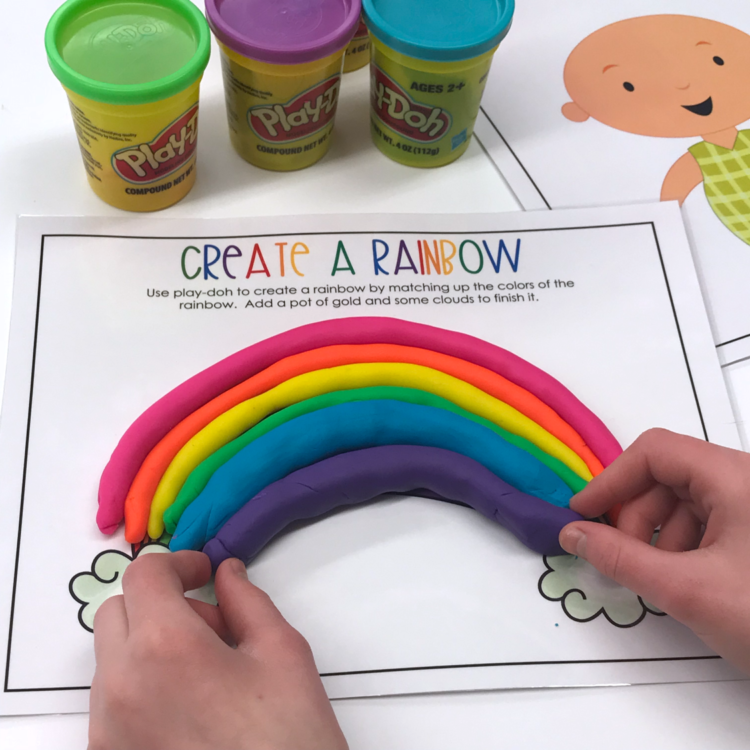 Play-doh is a no-brainer. 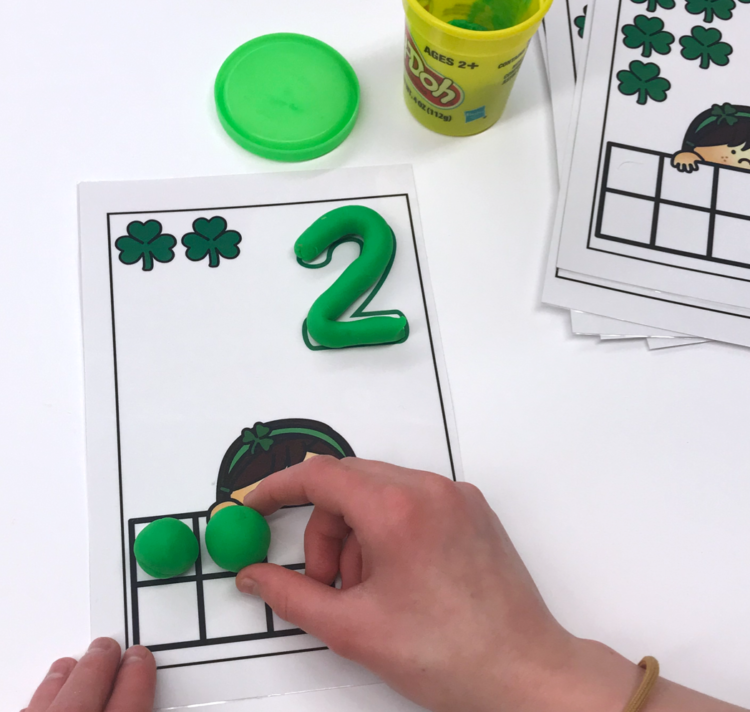 Students love it, it is GREAT fine motor and so versatile that you can use it to practice a variety of skills. 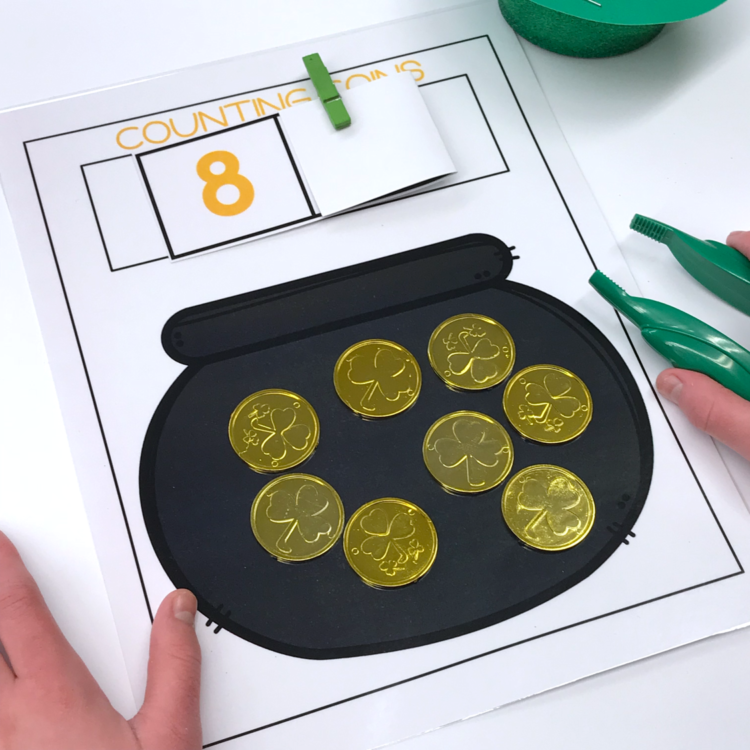 This is a simple counting activity which is great for students still struggling with numeracy. 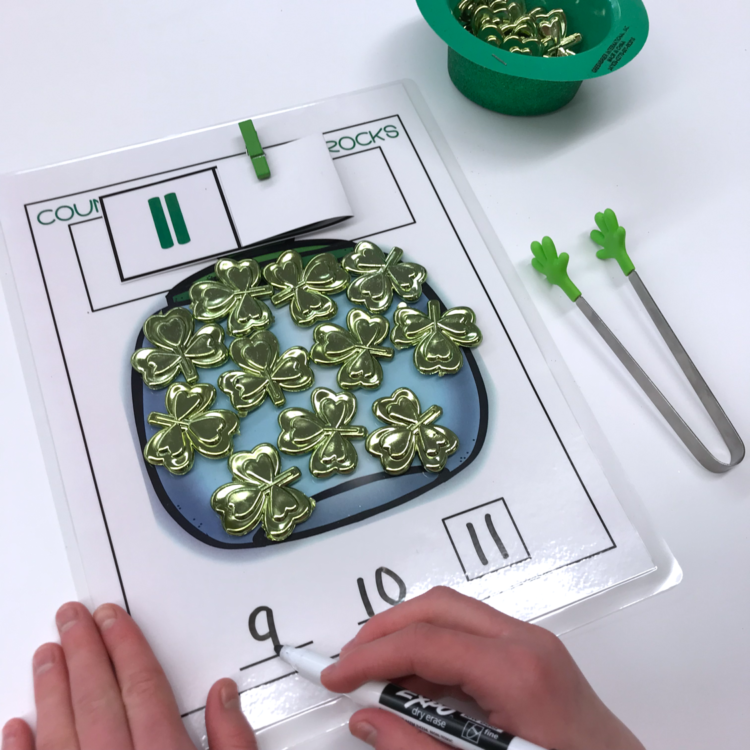 For my friends who are moving on to ten frame activities, I can offer a similar activity where they construct the number as a ten frame. 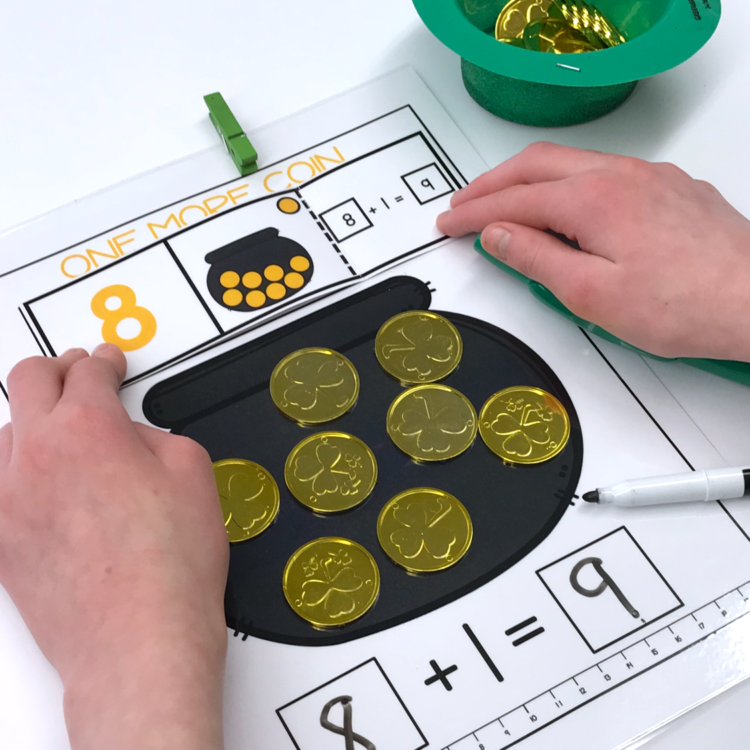 And for those students needing a greater challenge, they can create the number and tell me how many more they need to make ten by completing the equation. 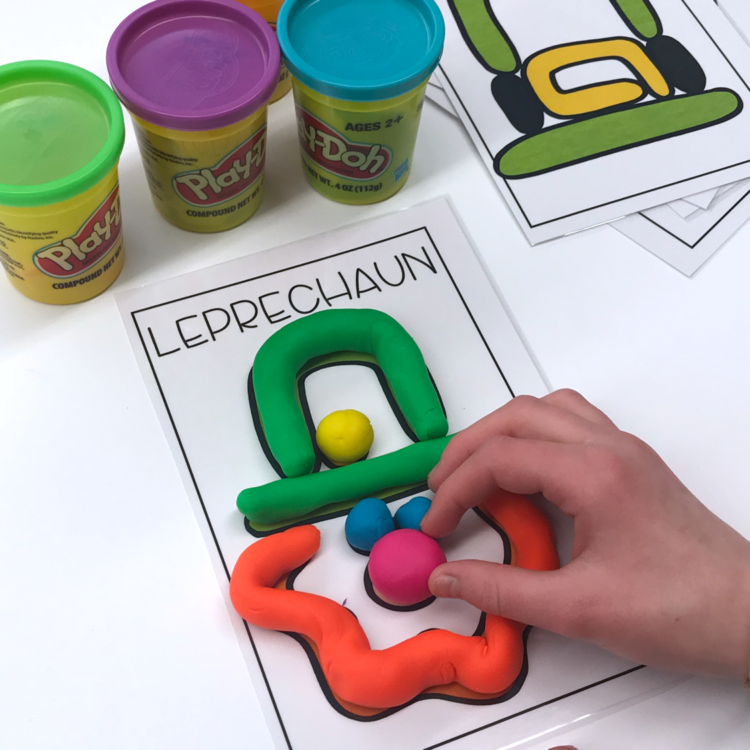 For a more open-ended activity, students can use mats to create a rainbow or dress the leprechaun. These play-doh mats are especially great for thematic vocabulary. 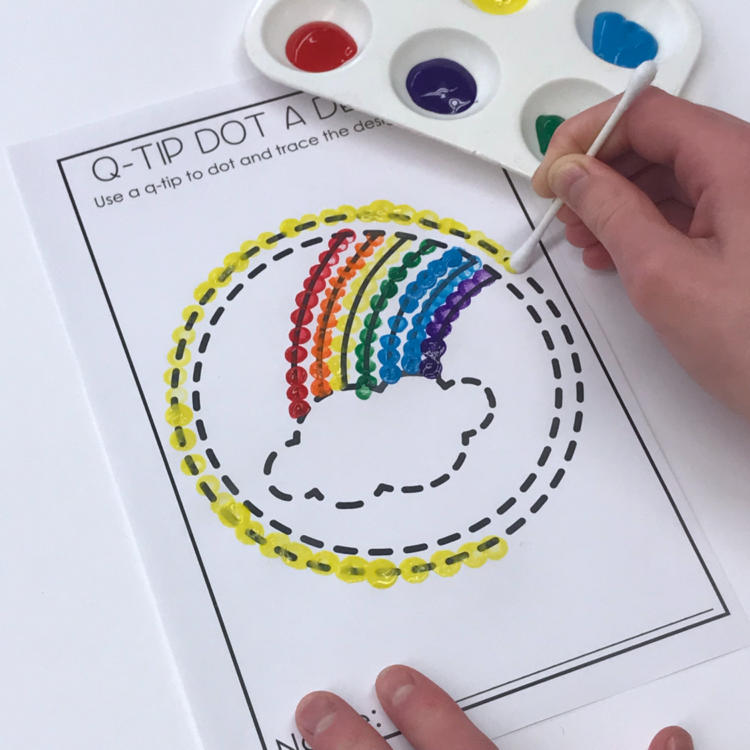 A favorite in my class is always the q-tip painting activities. This month is all about rainbows and St. Patrick’s Day. I always give my students a choice between the many pictures offered. Do you use therapy putty? This month I have a couple of options for you based on what you can find in your local Dollar Tree or Walmart Stores. 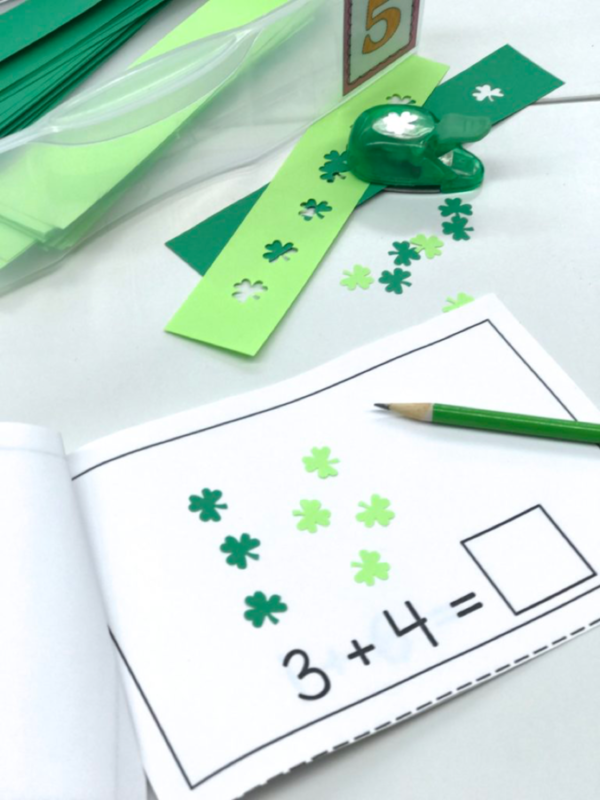 These first manipulatives I hid are from a St. Patrick’s Day necklace that I cut apart last year. They were a great item for my students to dig in and find. But I get that not everyone has access to those cute little necklaces so a rainbow of pony beads would also do the trick. 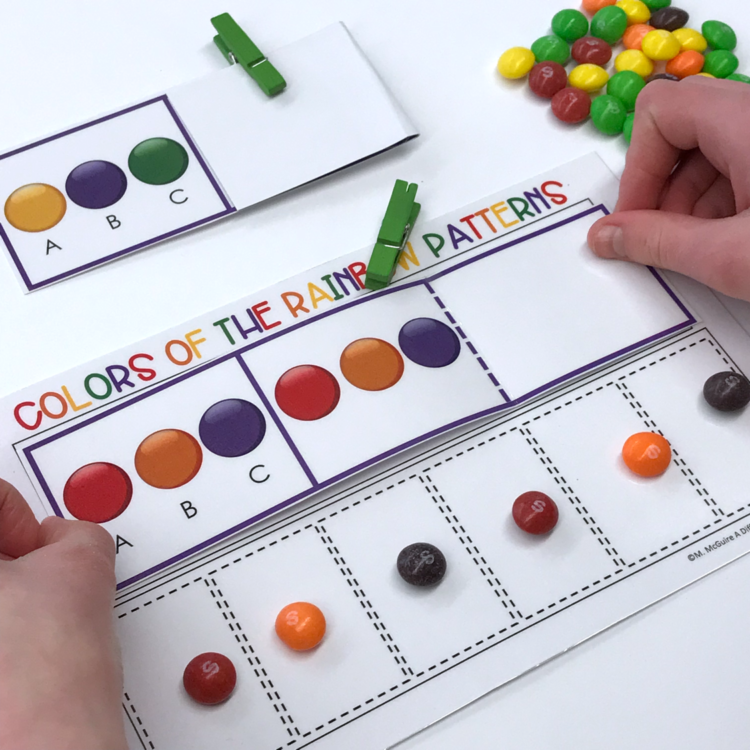 In this activity they simply graph the beads they find by color. 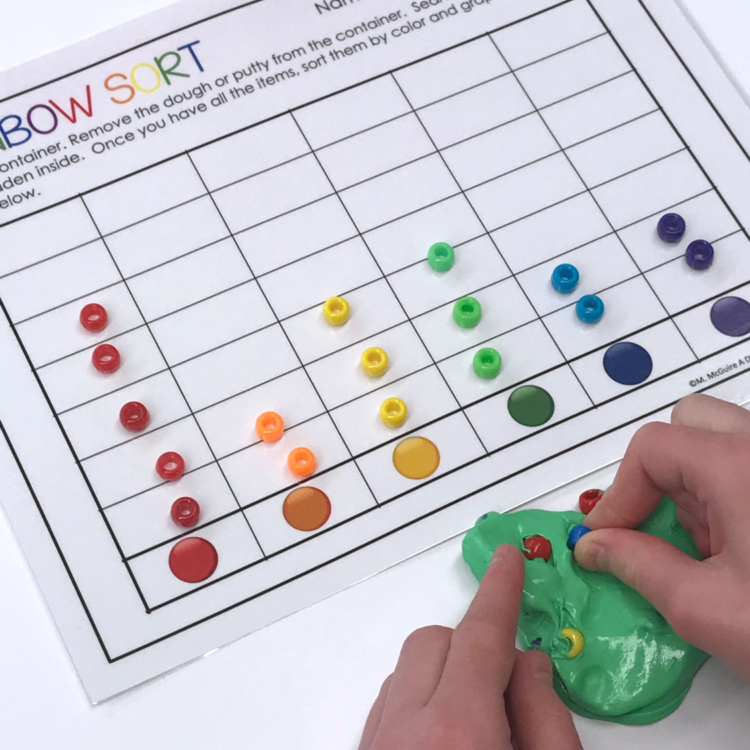 For a bit of a challenge, in this activity, they can graph and then count the beads they find. 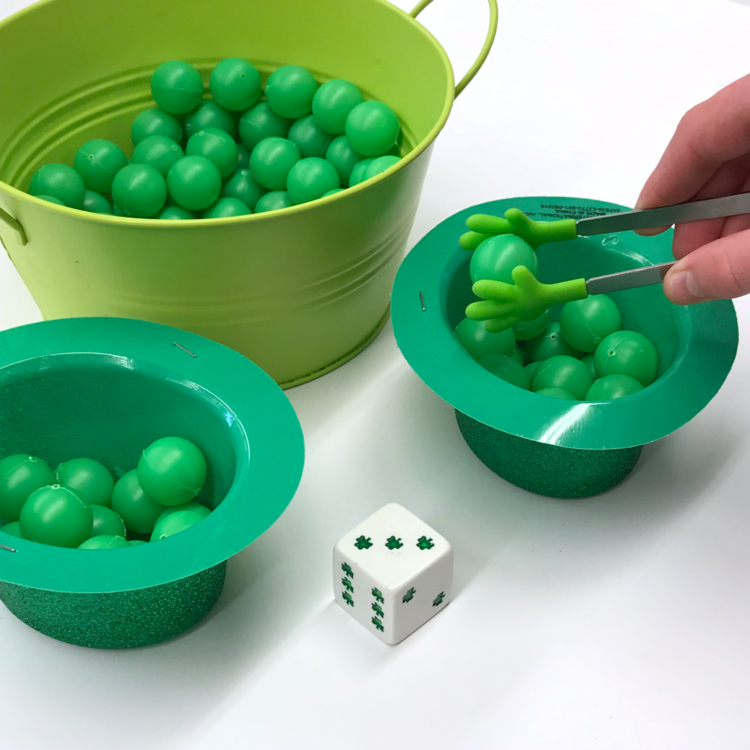 I love using these sweet little mini ping-pong balls and tongs to add some fun to this counting game. And how about this shamrock dice? Cute right? 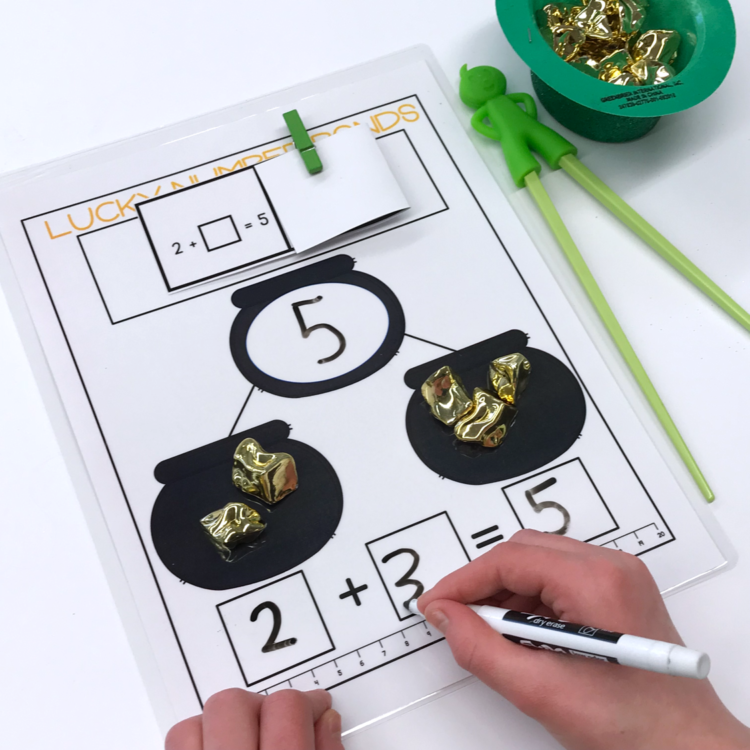 Well, it’s super easy to differentiate this activity just by changing up the type of dice you offer your students. 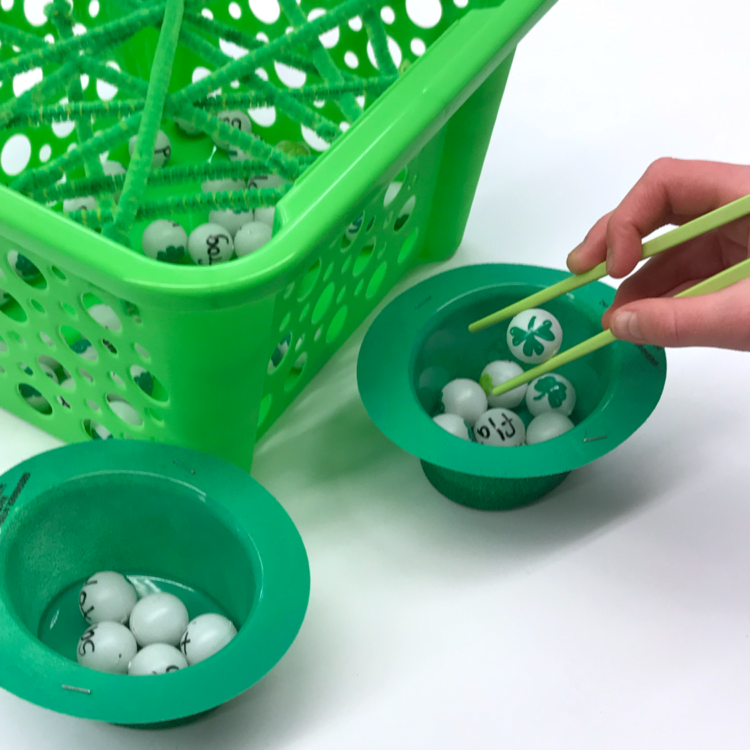 The leprechaun hats are from the Dollar Tree and make a perfect container to hold the balls that each player wins. Self-correcting cards are the perfect answer to independent stations because they give instant feedback to your students. 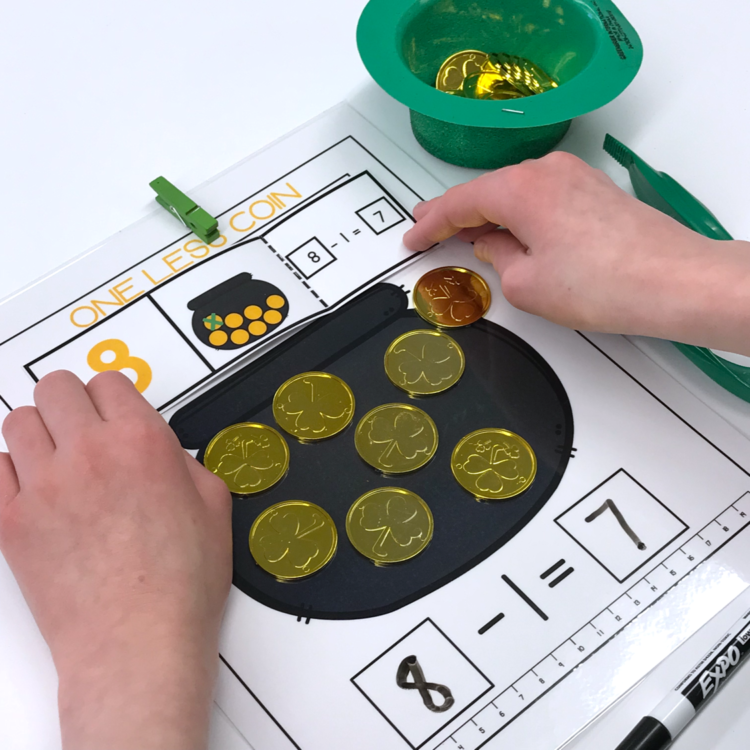 Here students simply move the gold coins to the mat using tongs to represent the number. Once they have done that, they open the card to see if they were correct. 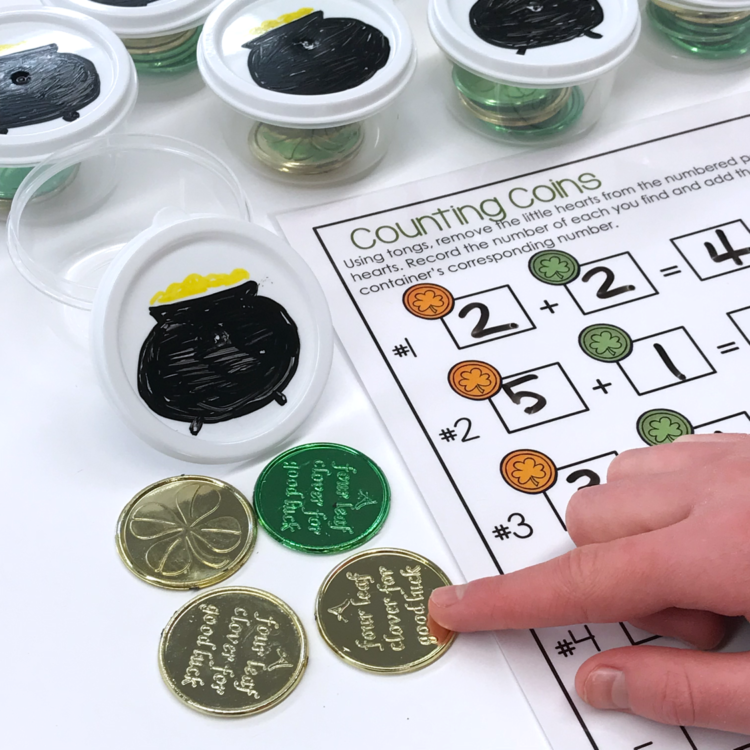 For students looking for a bit of a challenge, have them use the coins to answer the equation. Then once they have the equation, they can open the card to reveal the answer. Once less works the same way. Use the tons to make the number, take one away and complete the equation. Open the card, and then check your answer. 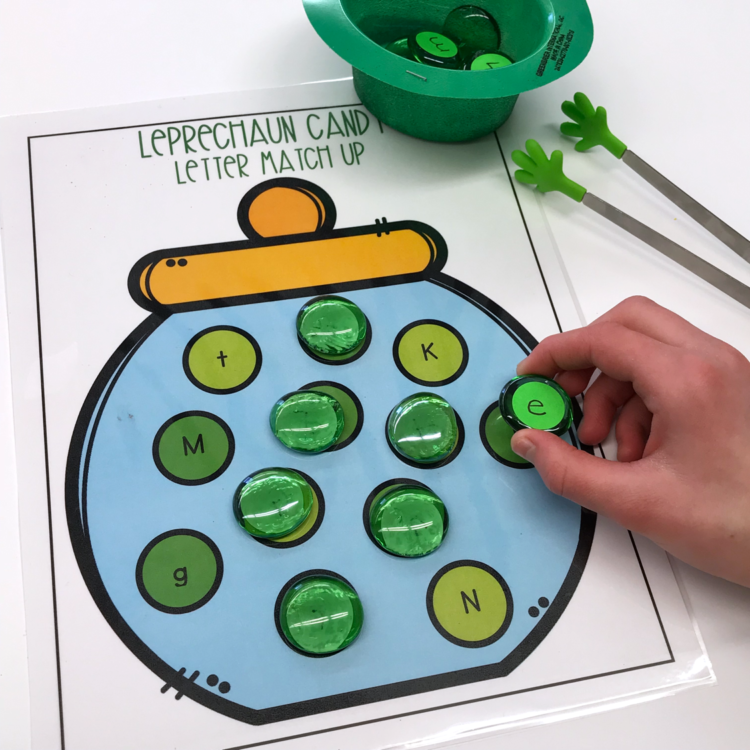 Grab more of those little green ping pong balls and this time write numbers on them and throw them in a leprechaun’s pot. You choose the tongs your students will utilize, they select a number. 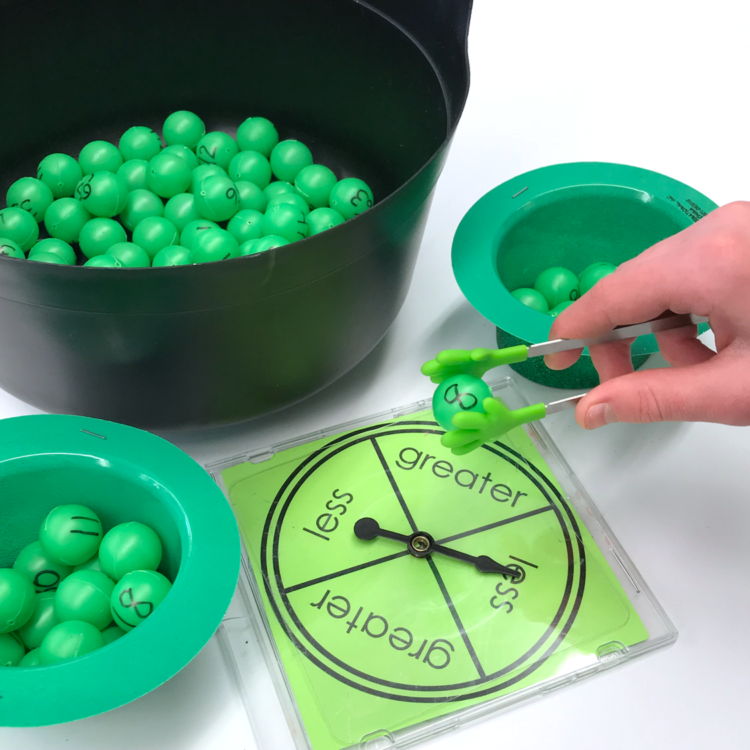 After they identify the number, a student spins the spinner to see if the greater or lesser number wins both balls. Those are placed in the players’ hat until all of the balls are used. 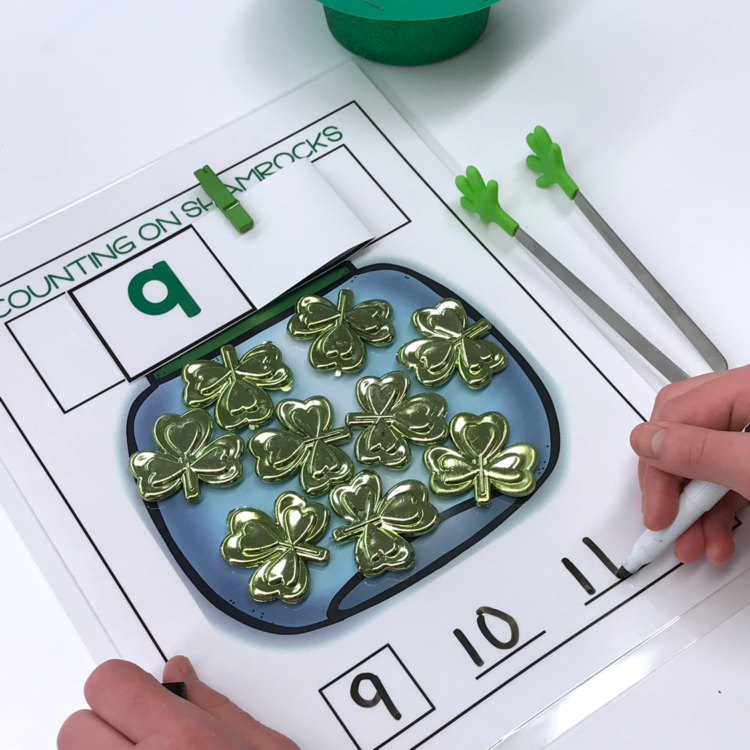 I found these sweet shamrocks and knew I just had to use them for a counting on activity. Don’t fret if you can’t find them. 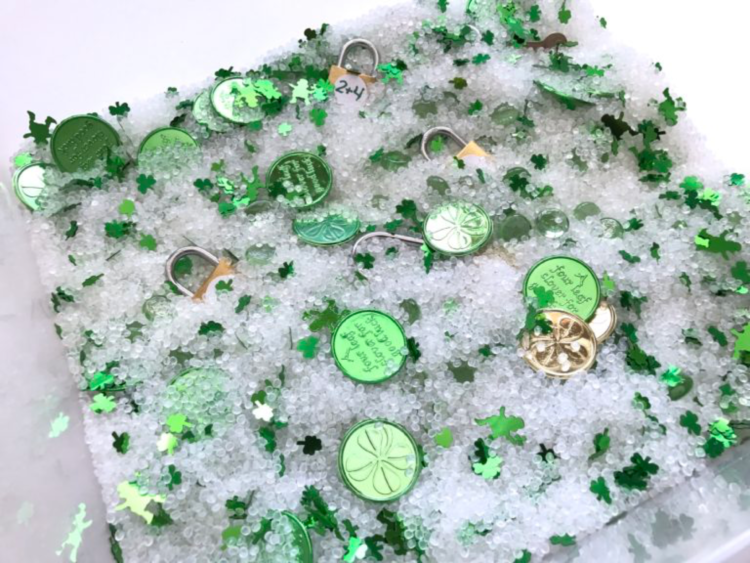 You can always use green pompoms or buttons or even foam shamrocks from a craft store. 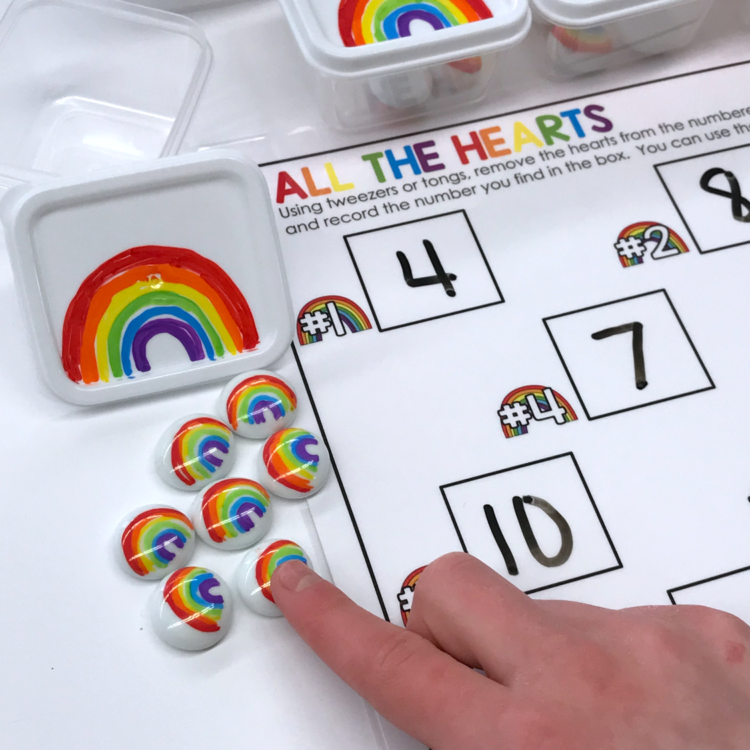 Students make the number on the card, write it in the square and count on by writing the numbers that come after. When they open up the card, they can see their answer. For those students that need a bit more challenge, they write the number in the box and then count back opening the card to reveal whether they are correct or not. Missing addends can be tricky so I’m always looking for ways that will give my students opportunities for practice. 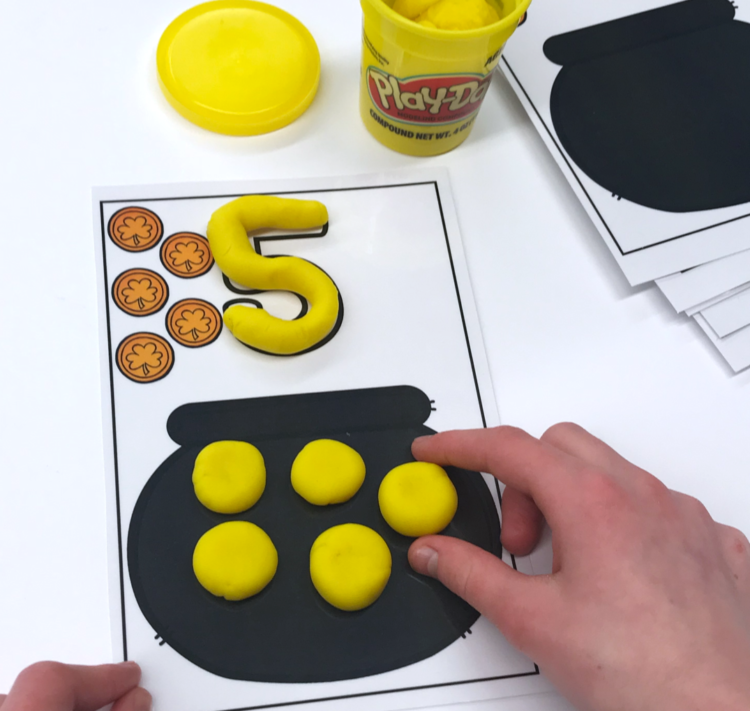 Number bonds are an easy way to give them some hands-on practice. 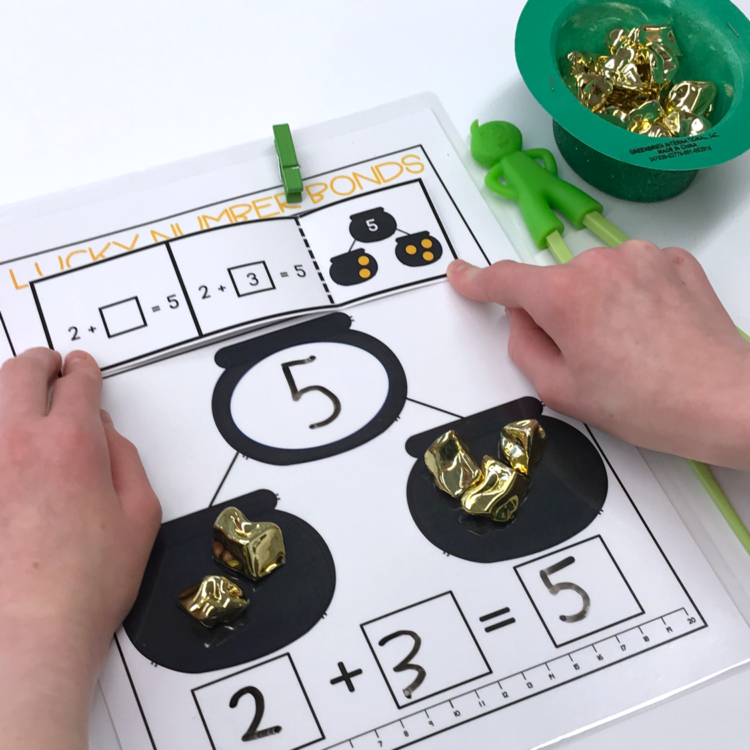 In this activity, I have these plastic gold nuggets that I store in Dollar Store leprechaun hats. 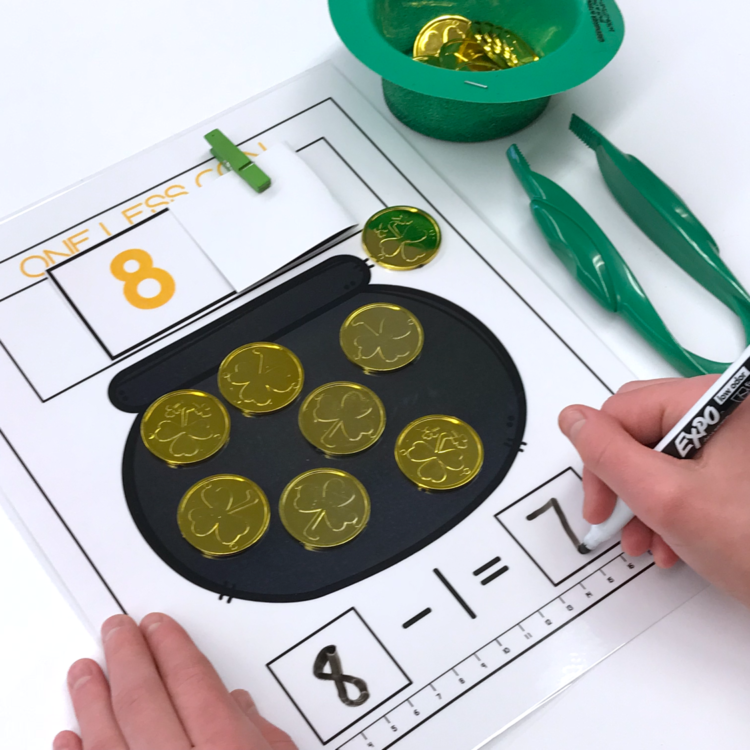 Students complete the equation and use the gold ‘leprechaun’ nuggets to find the missing addend. When they have it completed, they open the card to reveal whether they are correct or not. 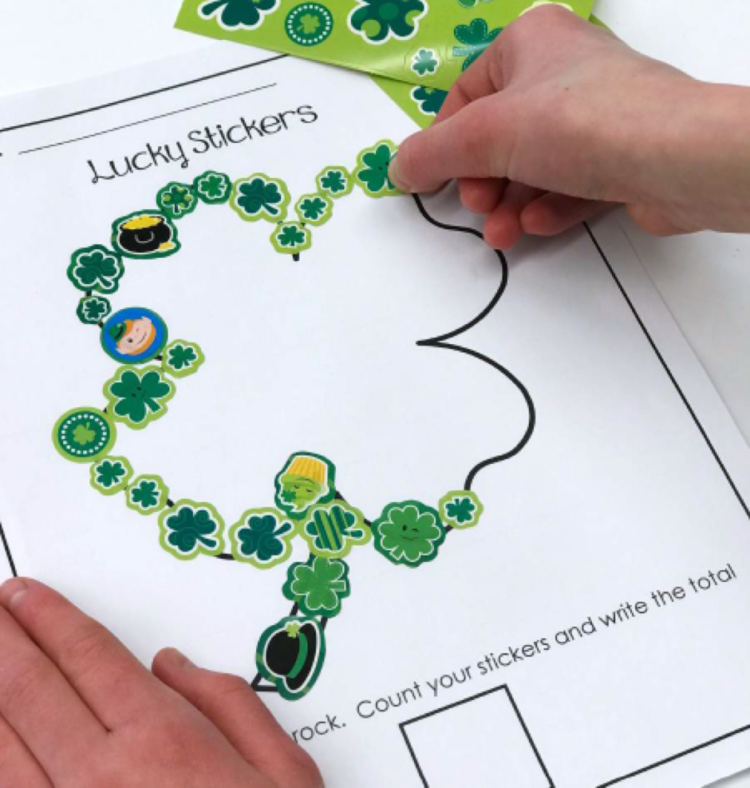 I had a tough time finding St. Patrick’s stickers this month, but you could easily use any green-ish stickers that you find. 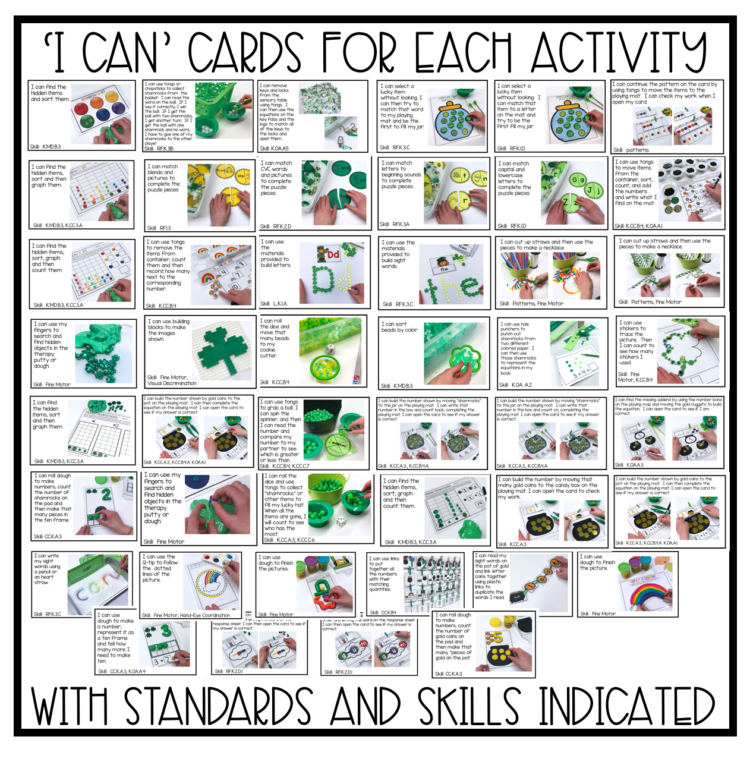 I do have a bunch that I use for Dot-It, Stick-It and Paint It activities that you can find HERE. 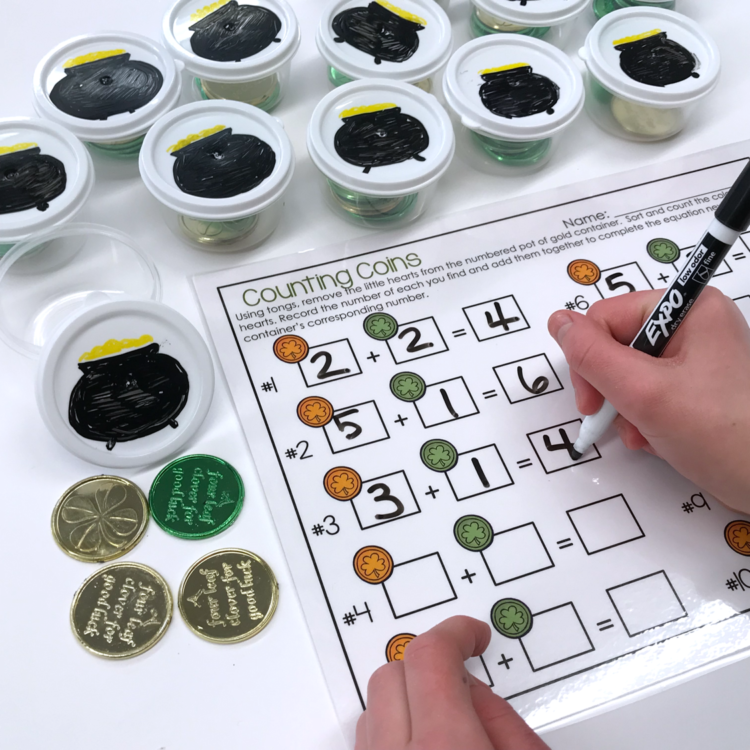 Students use stickers to outline the picture (there are several picture options from which to choose) and then count the number of stickers they use. 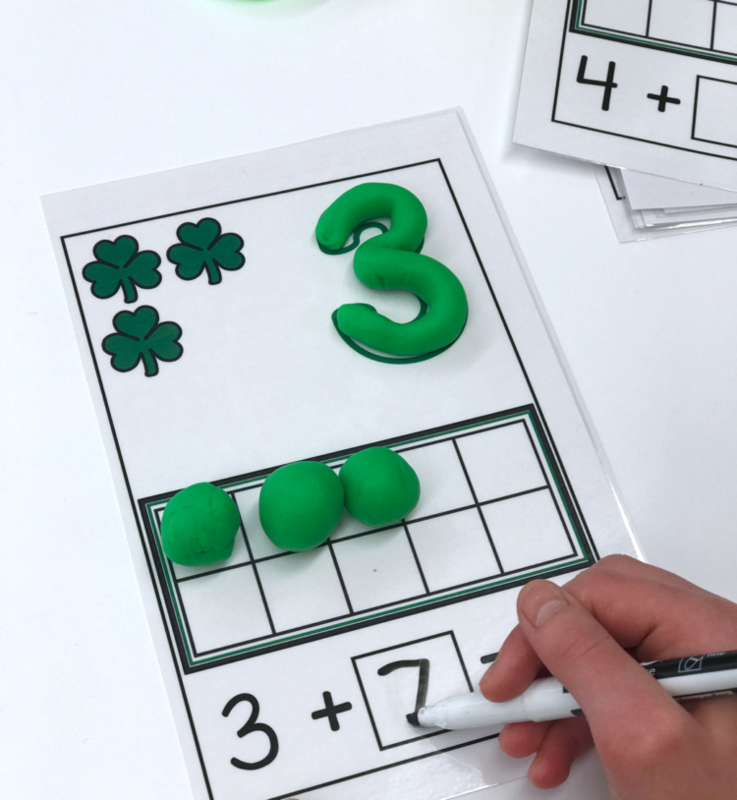 Using paper punches, students can get hands-on practice with addition. 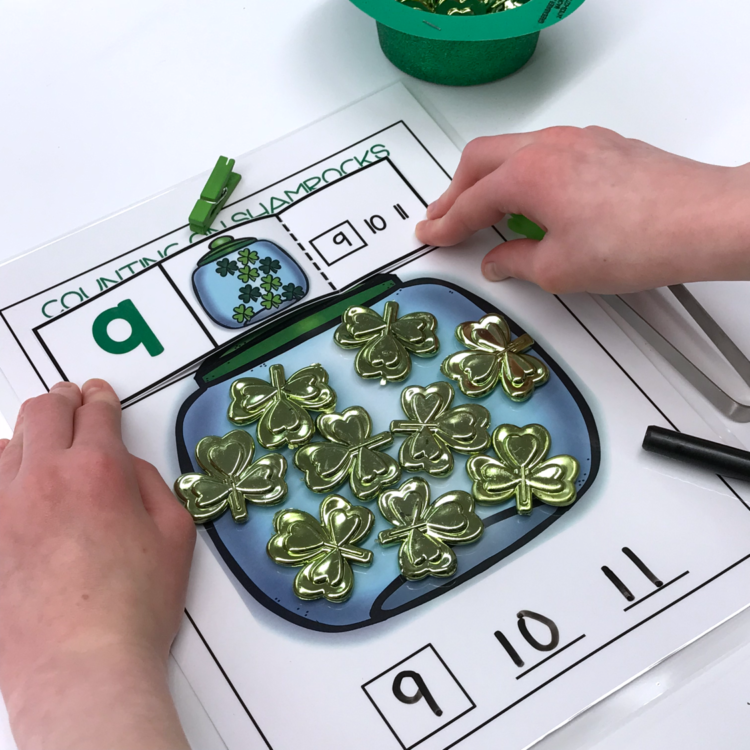 They simply punch out shamrocks in two different colors of green and illustrate the equations in the Lucky Addition booklet. There are differentiated levels of difficulty to challenge your students as needed. 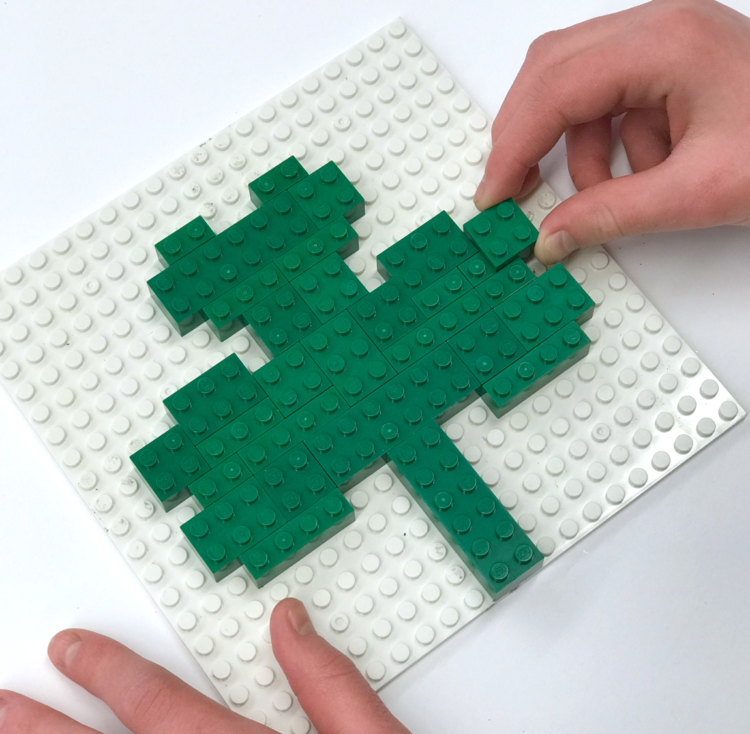 If you can’t find a shamrock paper punch, you can use stamps or stickers. 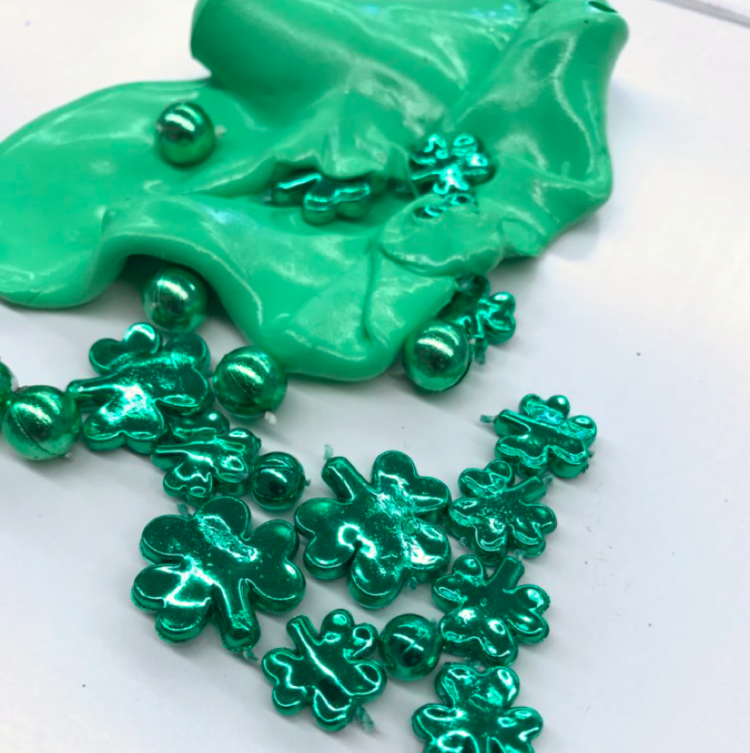 Break out your St. Patrick’s colored gel beads. 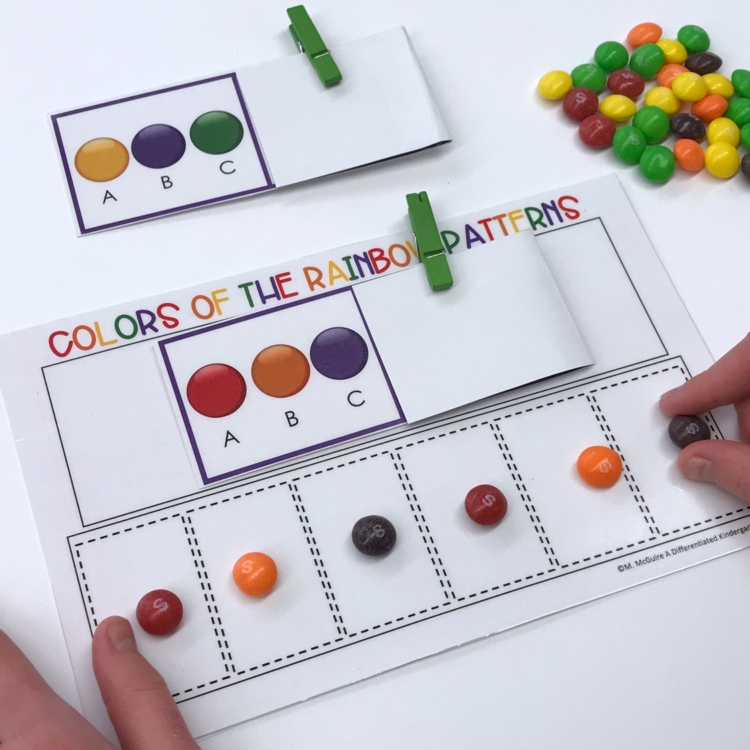 Students can sort them by color . 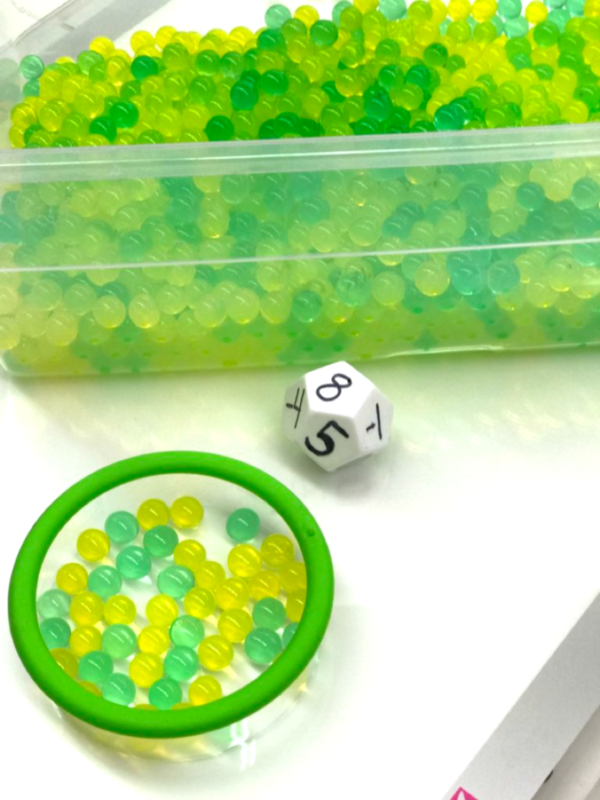 . .
Or create a game using different kinds of dice. My students are working on adding and subtracting so for this dice I have numbers programmed along with subtraction. The student to fill the bottom of their cookie cutter first is the winner. My students love finding out what each months’ Lego challenge will be. 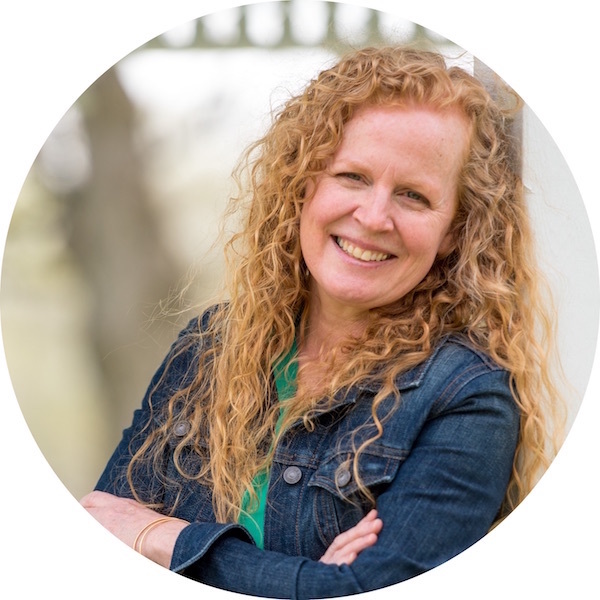 This month my three challenges are a shamrock . . .
. . . a leprechaun . . .
. . . or the ever challenging . . . rainbow. This is a tough one. 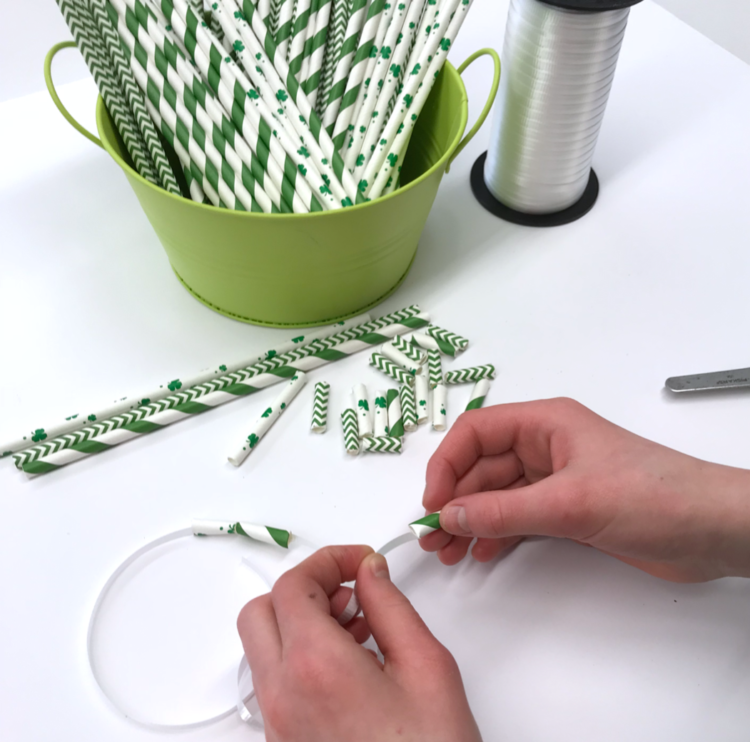 I keep waiting for my students to tire of cutting straws and making necklaces, but they never do. So here’s to everything green. You can grab paper straws from Amazon, Hobby Lobby and I even found some at Walmart in the party section. After they cut them up . . . string them on ribbon for a neckace. 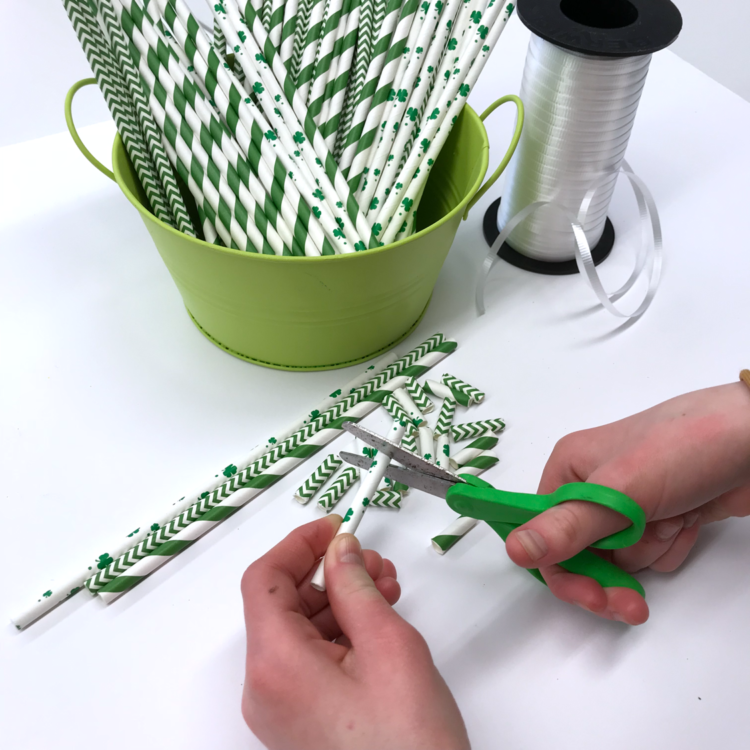 Can’t find green paper straws? 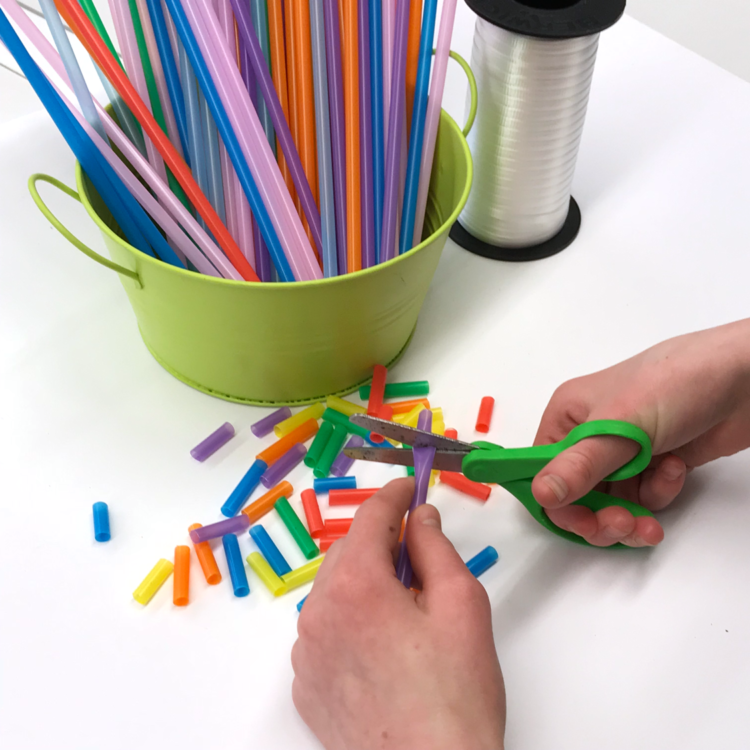 How about rainbow straws? 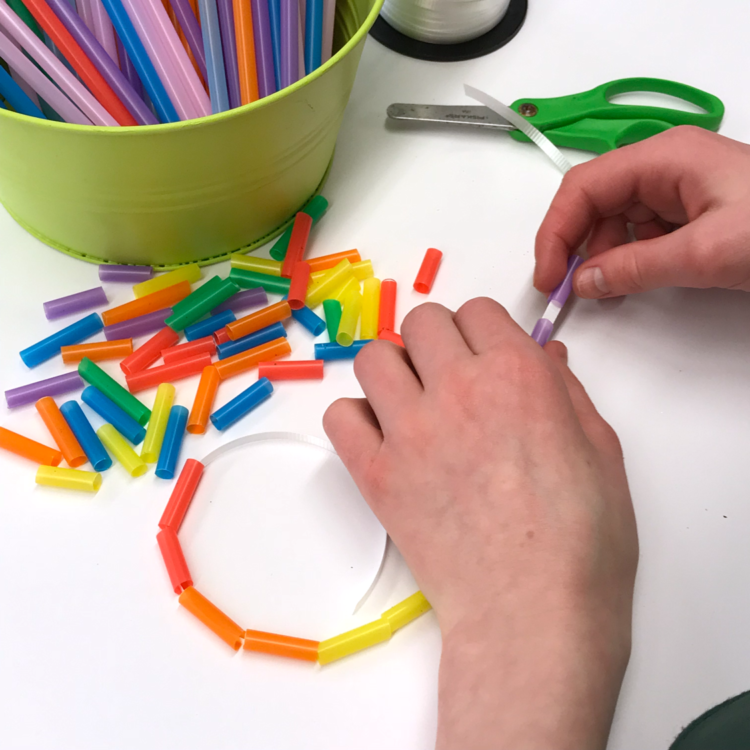 Students can string them on in rainbow order for a colorful necklace. 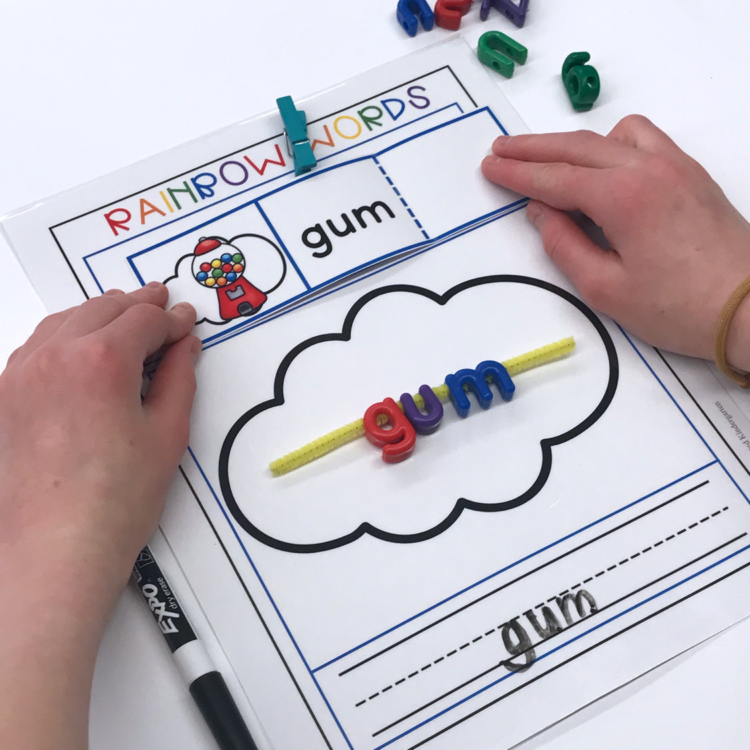 Practicing letters and sight words should never be JUST paper pencil. 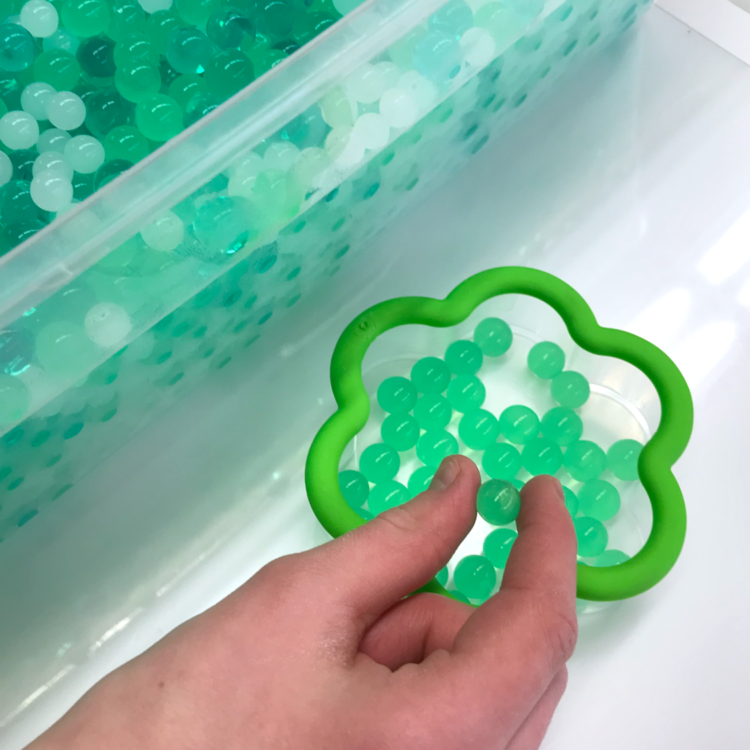 Using flat glass marbles or any thematic table scatter can make it fun and engaging. 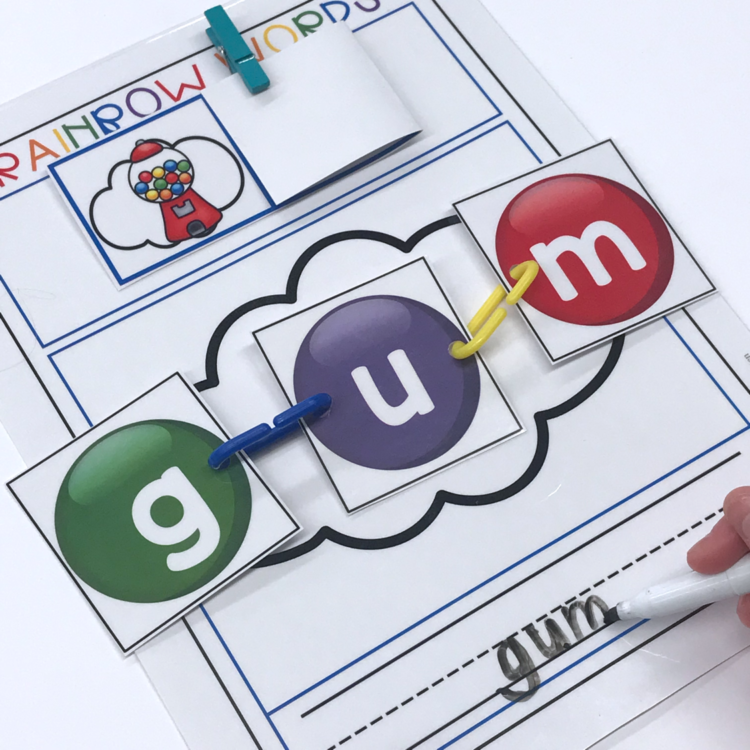 These sight word cards are editable so you can decide which words your students practice. 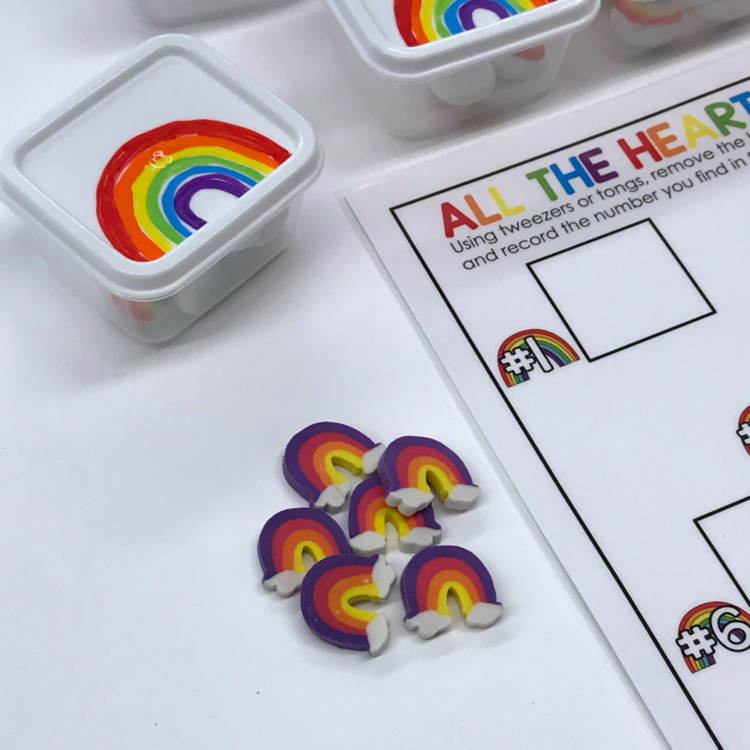 Last summer Target had these delightful rainbow erasers in their Dollar Spot which are perfect for this months Container Counting, but don’t fret if you weren’t able to secure you share. 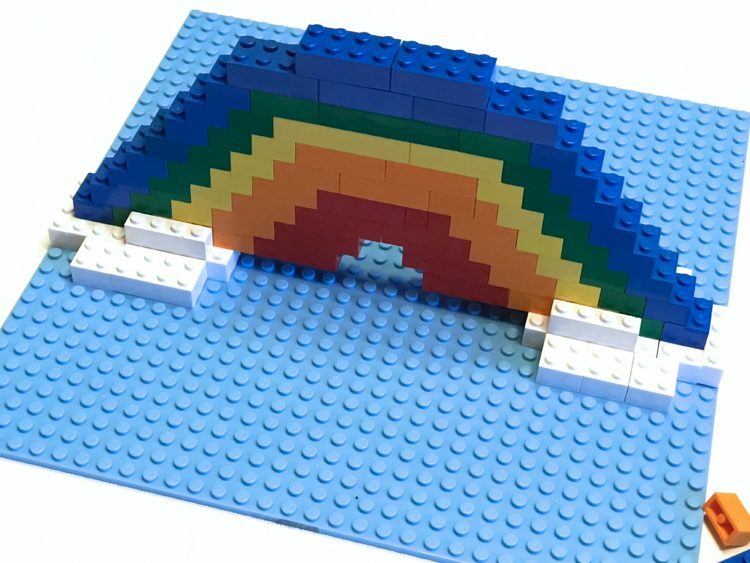 If you can find some flat white marbles and grab some rainbow colored paint pens, you can make your own rainbow manipulatives. Here students grab a container and count the rainbows. Then they write the number they counted next to the corresponding number from the bottom of the container. 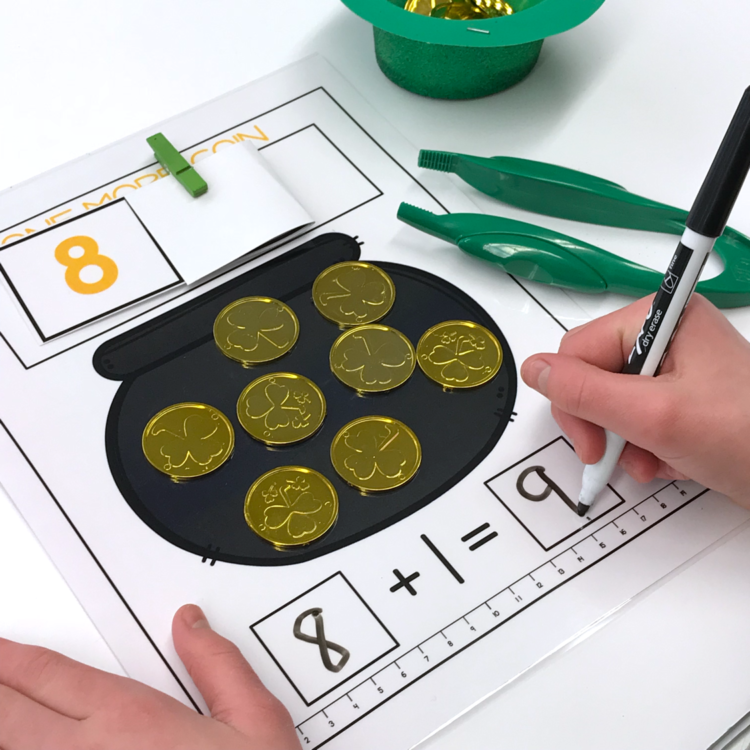 For the addition edition of this activity, I found these gold and green coins at the Dollar Tree but you can also get them on Amazon. 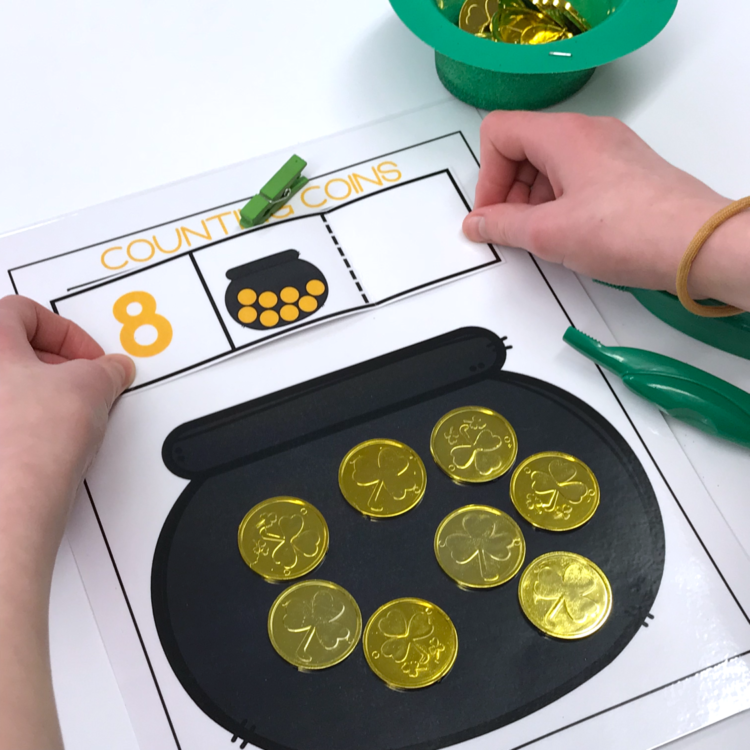 Students go ahead and look at the number on the bottom of the container, then write the equation that corresponds to the number of gold versus green coins. Then they complete the problem. 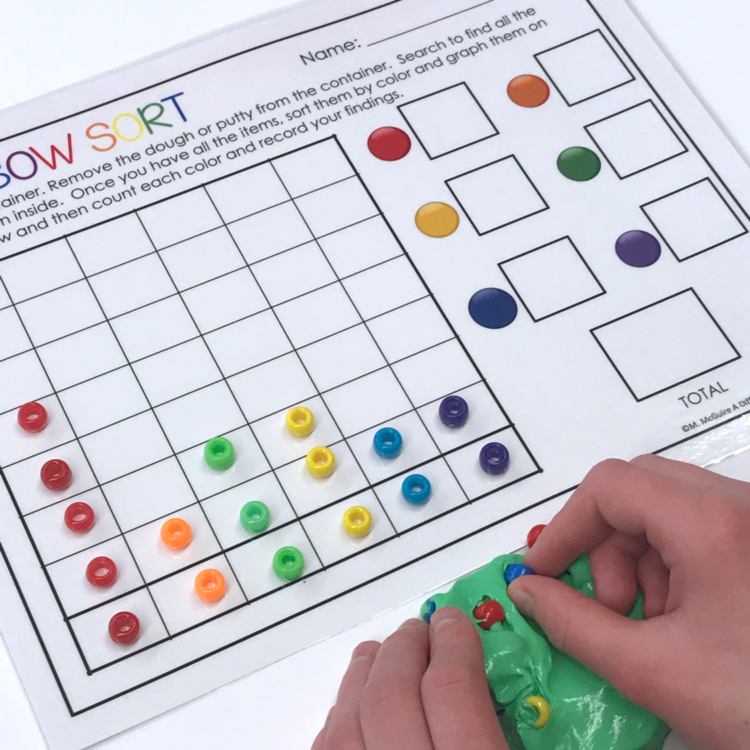 If you enjoy incorporating sensory activities into your morning work, these puzzles are a great addition. I use polypropylene beads that are also used for doll stuffing and add thematic items such as gold coins, confetti or table scatter. Then I add the puzzle pieces. Because these pieces are in black and white, I can organize them for easy differentiating by printing them on different colored Astrobrights cardstock. 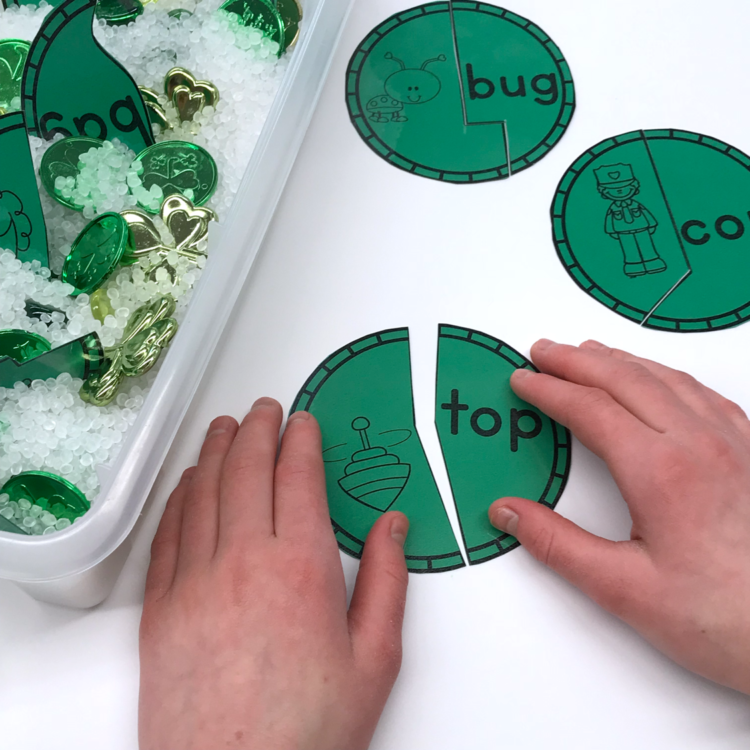 This green set is for capital and lowercase letter match-up. 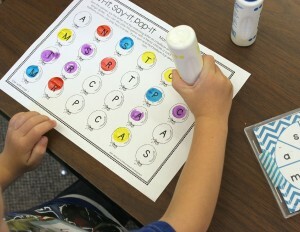 This yellow set is for initial letter sound and lowercase letter match up. 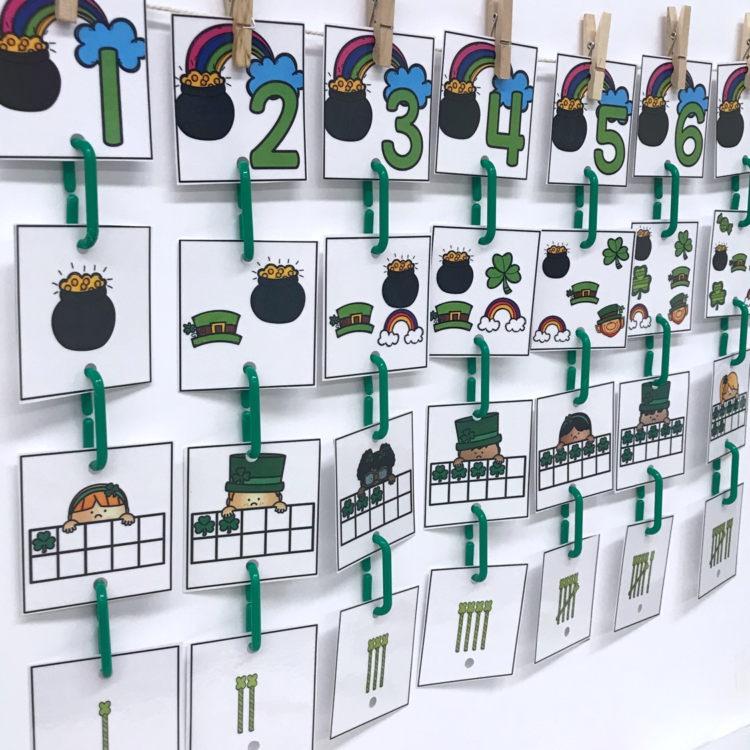 The dark green set is for cvc words and pictures. And the gold set is for blends and pictures. I know not everyone can use food in their classroom so feel free to substitute pompoms, buttons or beads for Skittles if you need to do so. I have the luxury of no restrictions and no allergies this year so I thought I’d take advantage of it and make this a fun and tasty station. You can usually find all the colors you need in a small snack pack of skittles. Students carry on the pattern they see on the card . . .
then open the card to see if they did it correctly. More uses for those flat green glass marbles that you picked up at the Dollar Tree. 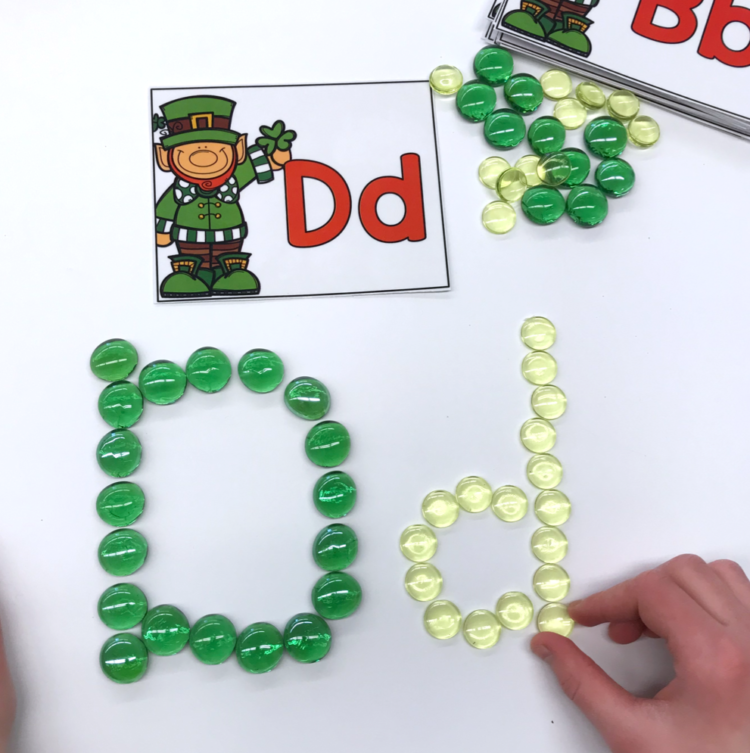 This time you can program the playing sheet with the letters you choose to have your students practice. 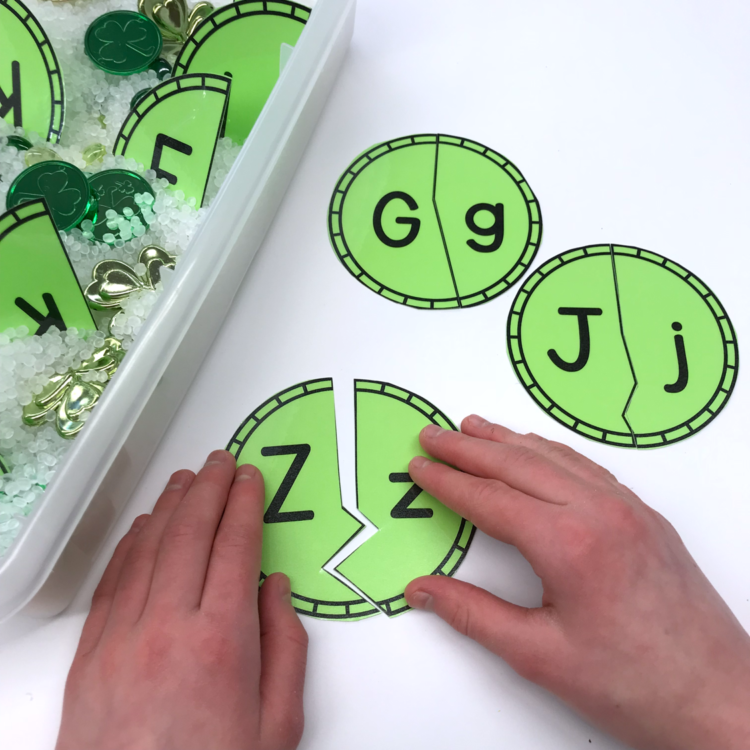 Then I put round green stickers on the bottom of green flat glass marbles with the matching capital or lowercase letters. Students take turns grabbing a marble without looking and match it to their playing card. The student who completes their card first is the winner. 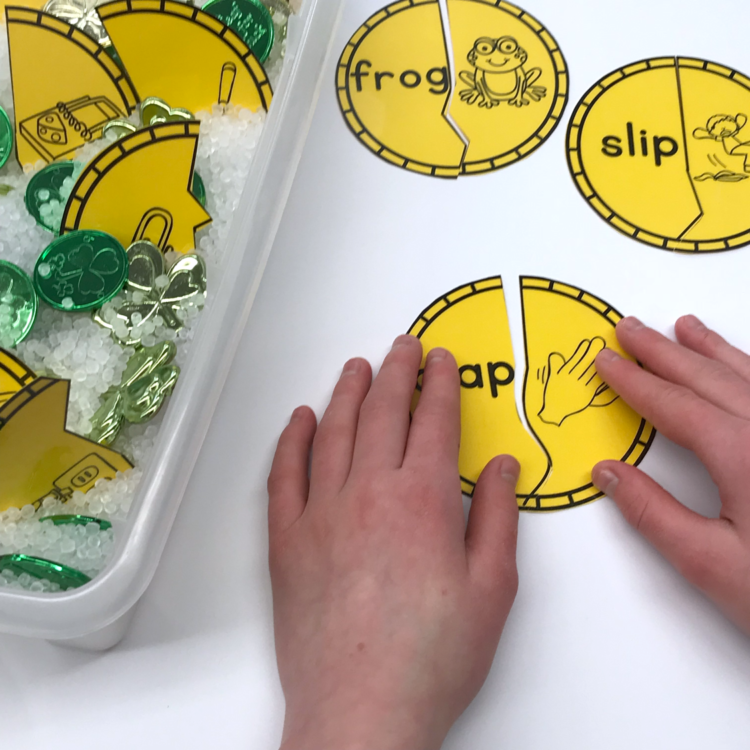 For students working on sight words, there is a playing mat that can be programmed with sight words instead. Get your sensory bin out for this one. I have locks and keys programmed with different addition and subtraction problems. Students search the bin for the keys that match the locks. It’s a great self-correcting activity. 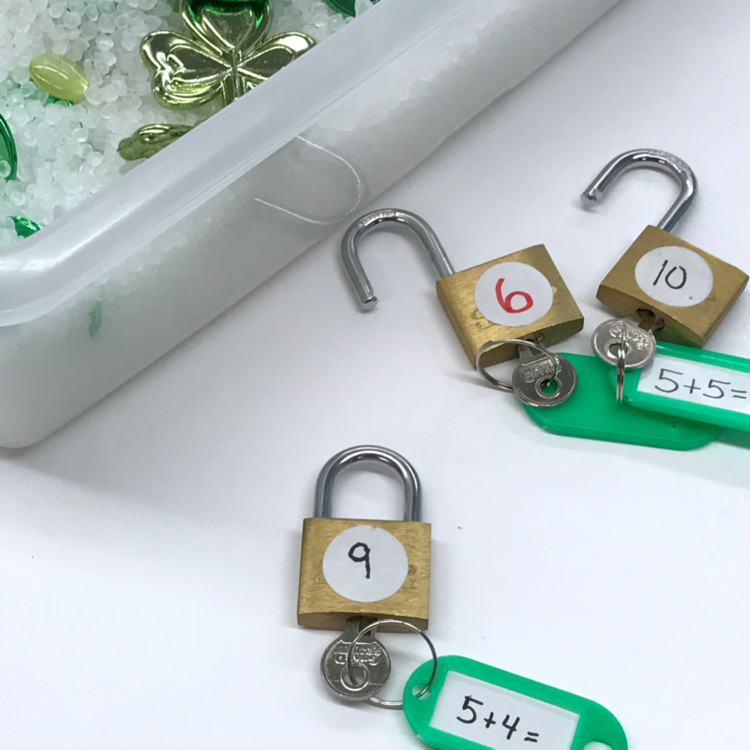 But just make sure that if you use this activity, you purchase your locks and keys individually or secure them from parent donations so you are assured that they are all keyed differently. If you buy them in a lot of 2 or 3, they will all be keyed the same and it will kind of defeat the purpose. The Dollar Tree has these little baskets with holes on the sides in every conceivable color. 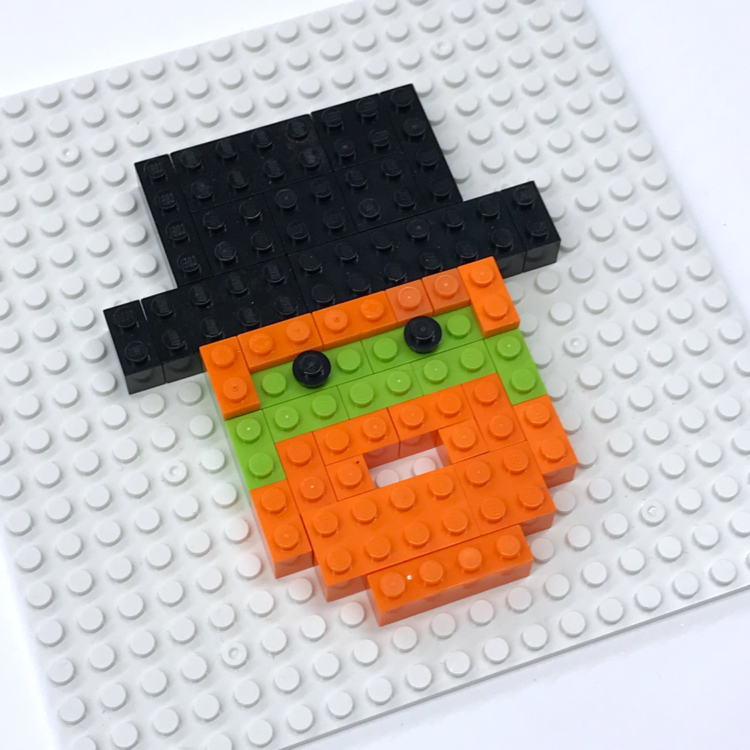 Since my own students really enjoyed this activity before, I’ve brought it back with an Irish flare. Grab those mini ping-pong balls again. This time I have shamrocks painted on them along with cvc words. 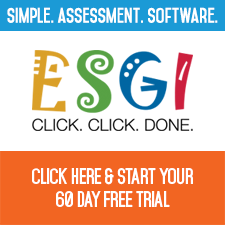 (You can program yours with letters, numbers, blends or whatever skill you need to practice.) Students select a ball using tongs (or in my case chopsticks) and read the word on ball. If they read it correctly, they keep the ball and place it in their leprechaun hat. If they get the ball without a word on it, they have to put all their balls back. If they get the ball with a four leaf clover, they get to go again. The student with the fullest hat wins. And that’s this month’s activities. 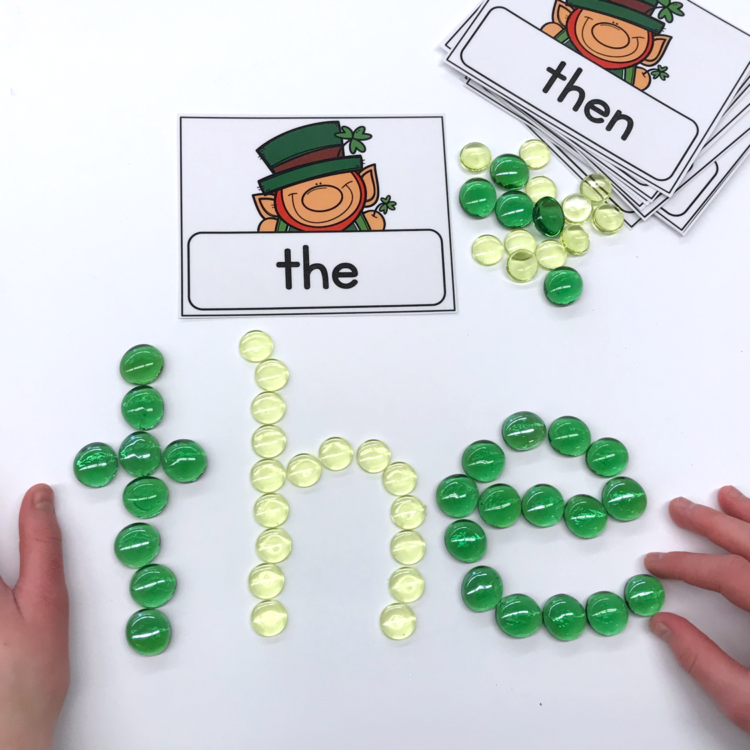 Remember, this set not only comes with the printable materials you need for each station activity, but it also includes an ‘I can’ card like the ones below to help make these stations independent. If you’d like to check these out in my TpT store, just click on the picture below or HERE.